I was chuffed to bits, as you can probably imagine! Unbelievable! I just couldn’t stop grinning afterwards! 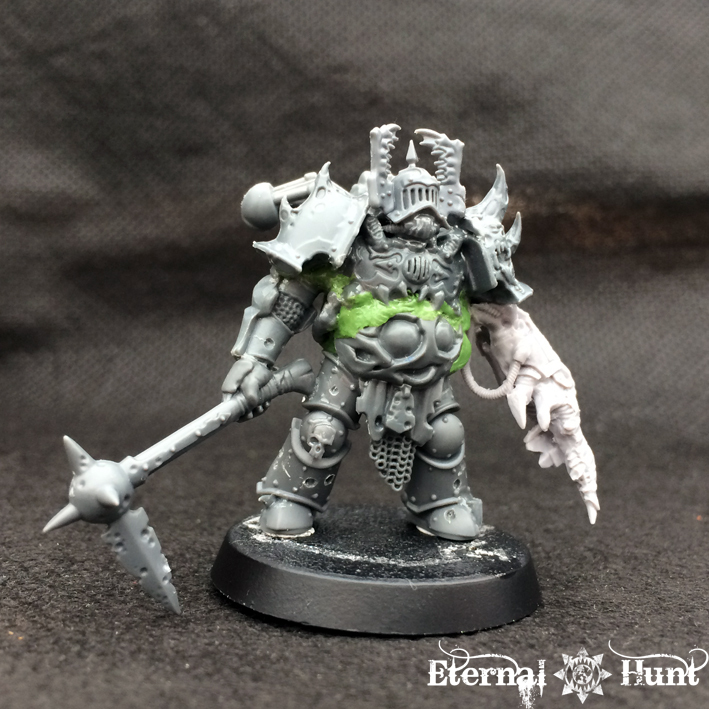 But enough about my ego: I promised you Khornate WIPs, and you shall have them. 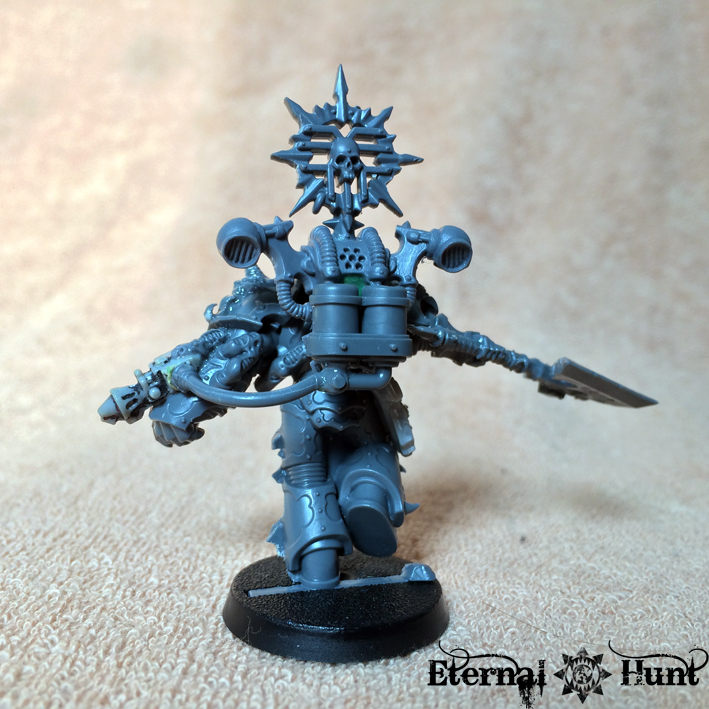 So allow me to show you what’s been happily bubbling away in the depths of my kitbashing laboratory for the last days and weeks. 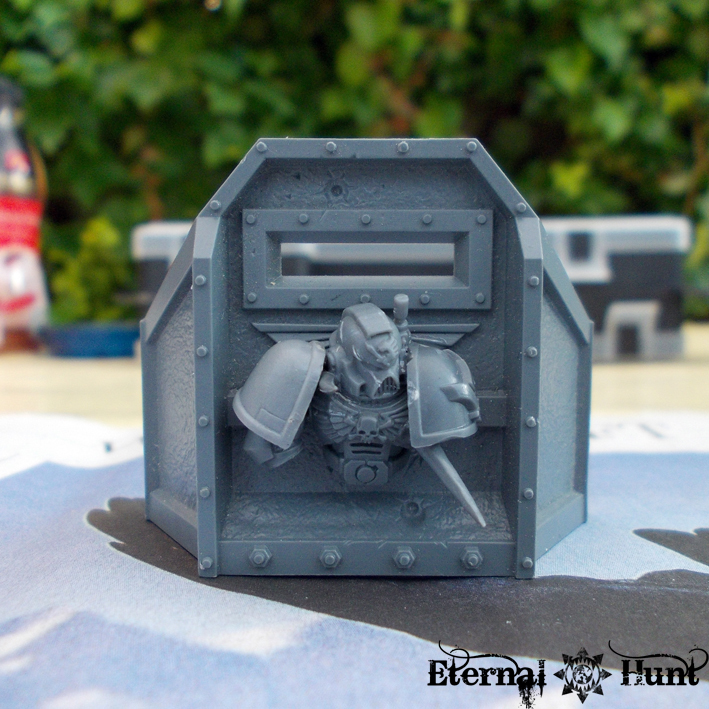 One last warning, though: Beware ye, who enter here: There be lots of unpainted grey plastic ahead! 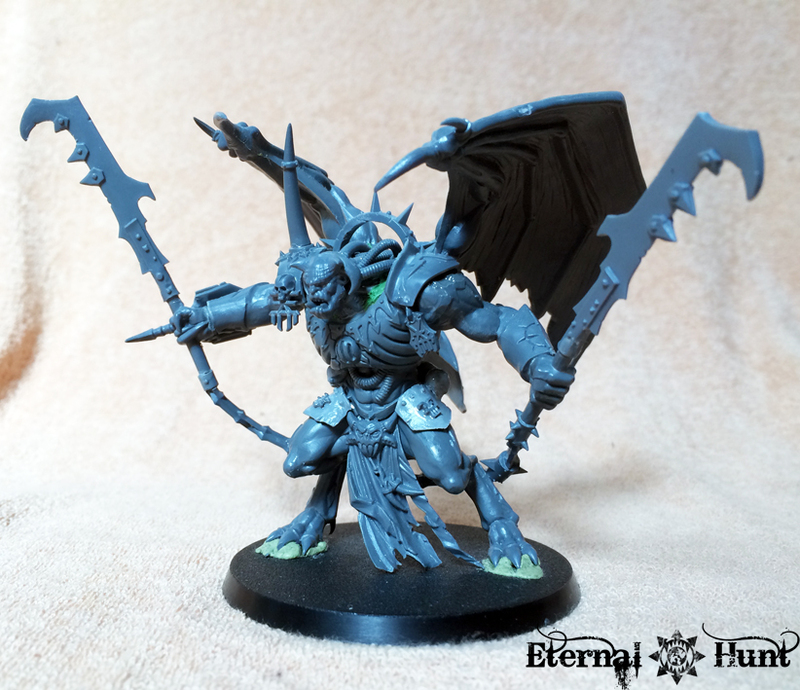 I bought my own Bloodthirster on the day of the release, although I hadn’t even planned to: I just couldn’t resist when seeing the box at my FLGS, and seeing how there was still one of the kits available for purchase, I jumped right in. So far, building this model has been a lot of fun, since it continues the trend of well-planned huge kits begun with the Imperial Knight. But let’s take a look at some pictures, shall we? 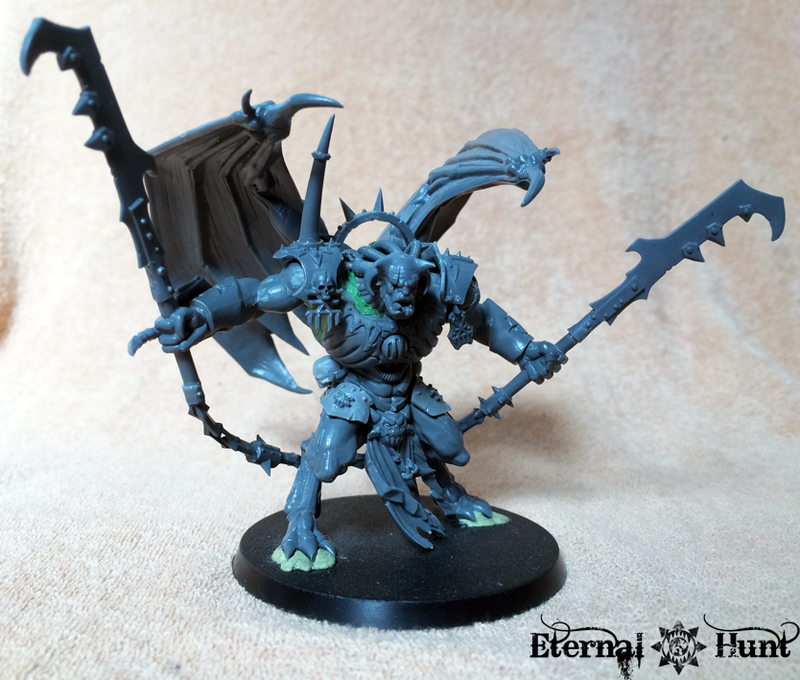 This is my Bloodthirster after an hour or so. Now I did take it fairly slow, even though it may not look like it: Like I said, it’s a wonderfully engineered kit, and it went together extremely well, for the most part. 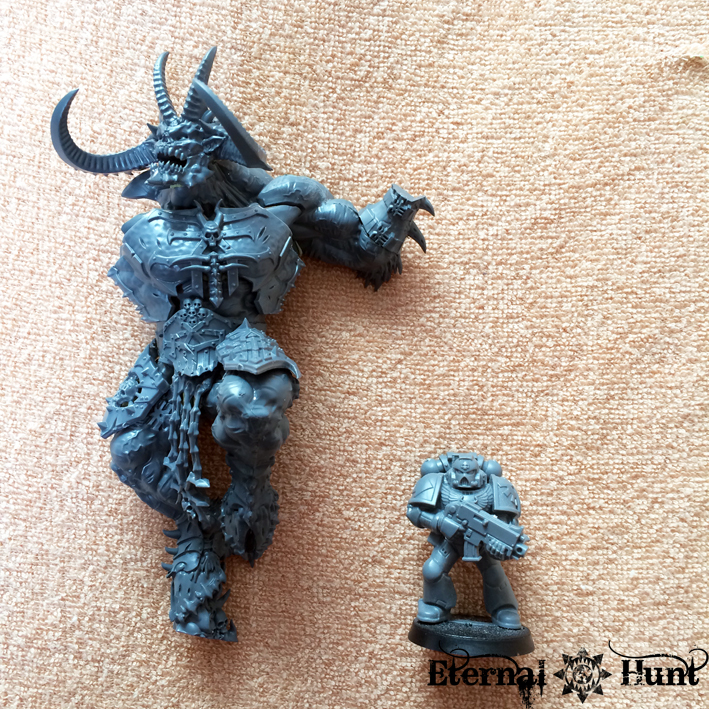 The Bloodthirster could always have been bigger, of course, but I am rather happy with the model’s size and bulk. 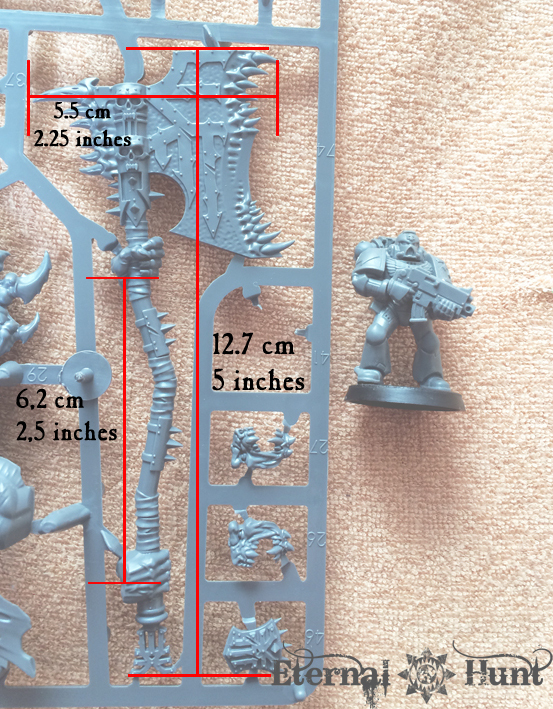 There’s also a very handy scale conversion pic here, for those of you who want to know how the model measures up next to the other Bloodthirster models released so far. 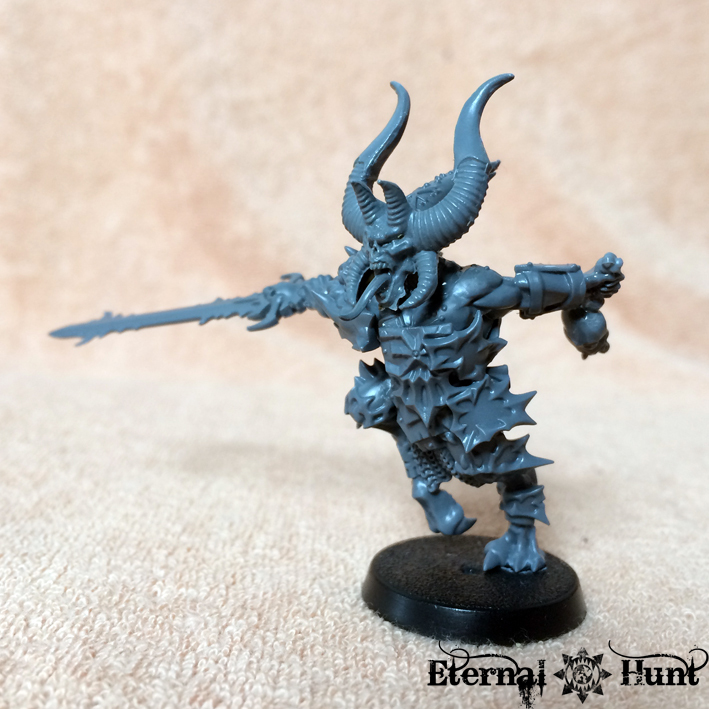 In fact, Noctus Cornix’ Bloodthirster conversion (which I already recommended you check out in my last post) goes for a mostly unarmoured look, and it works like a charm! 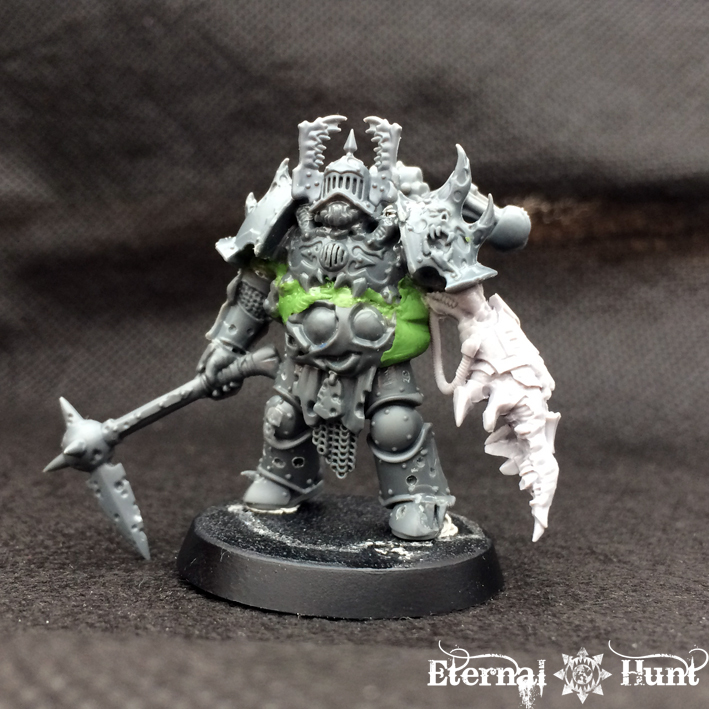 The only armour you will positively need is that belly plate, since he’ll have a pretty big hole in his torso, otherwise. 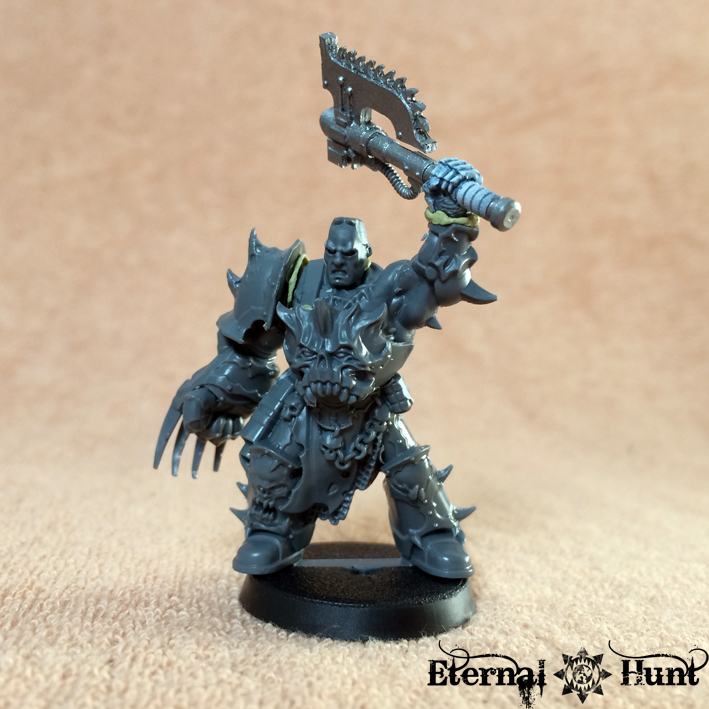 You get an additional set of arms (for the two handed axe) plus an additional left arm, depending on whether you go with the whip or that – very ridiculous – meteor hammer. There’s an alternate breastplate, loincloth and belly plate. You can mix and match between different setups with these. 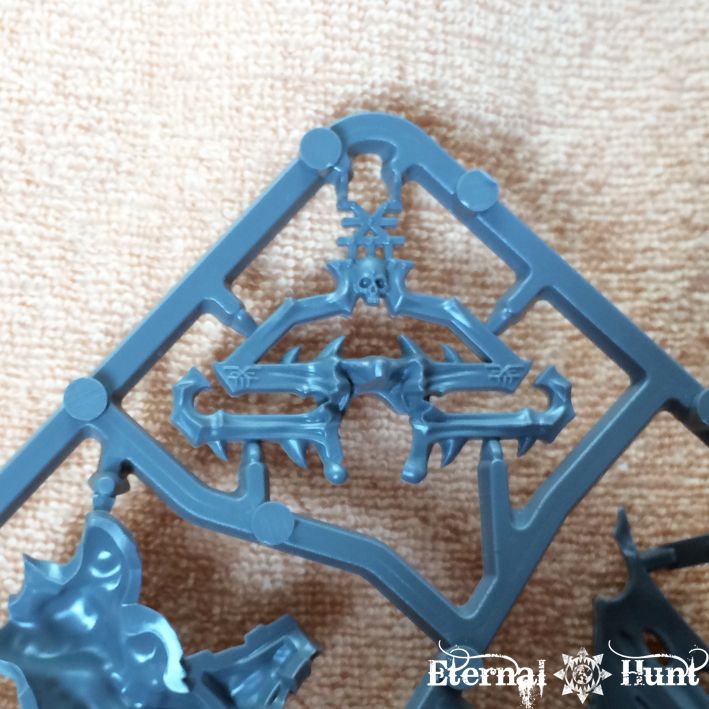 You get three complete heads (except for a tongue bit that is shared between two of the designs). 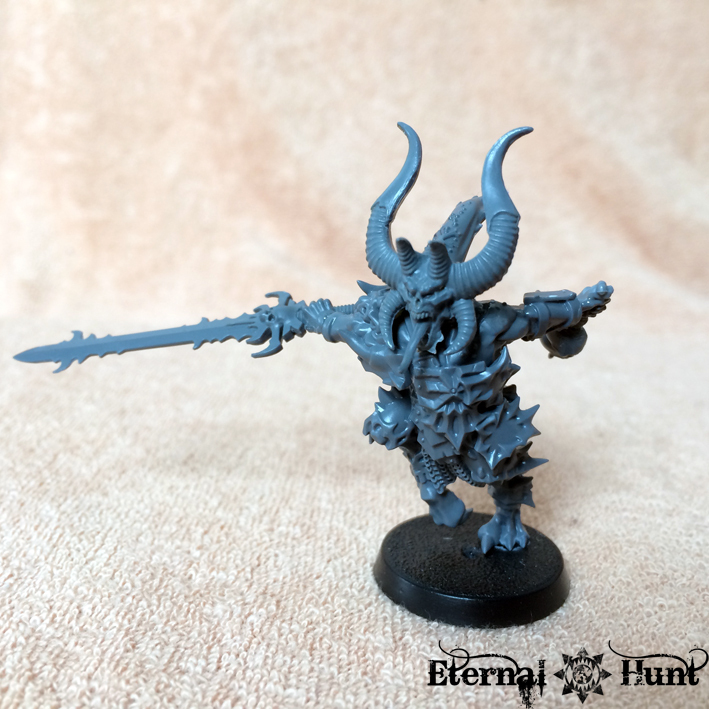 The leftover heads are slightly larger than those in the plastic Daemon Prince kit, so they might even be usable on your DP conversions. you get two axe heads for the one-handed axe. I. 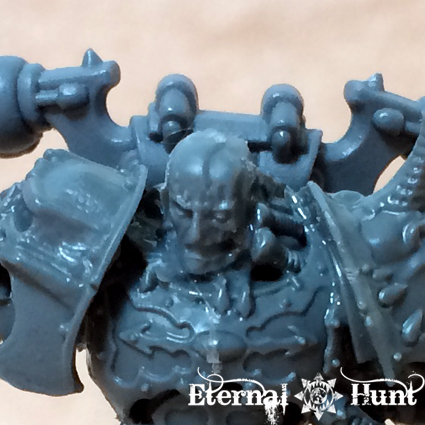 The optional skull shoulder pad is interesting in that it would possibly work as a facemask on a daemon engine or *gasp* even an Imperial Knight conversion (it works fairly well on an Imperial Knight head — I checked 😉 ). III. 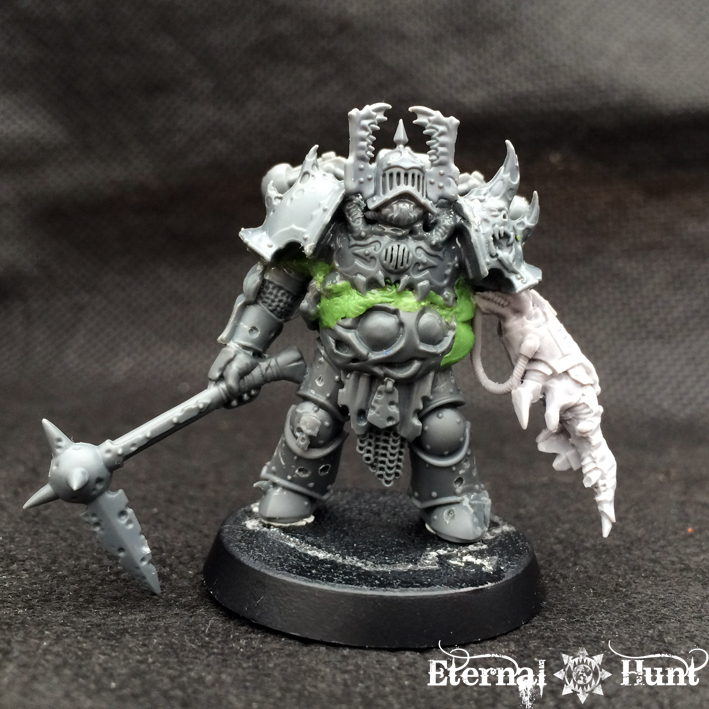 Here’s the alternate armour set you get: Those belly plates work pretty well as bespoke pauldrons for Chaos Terminators. 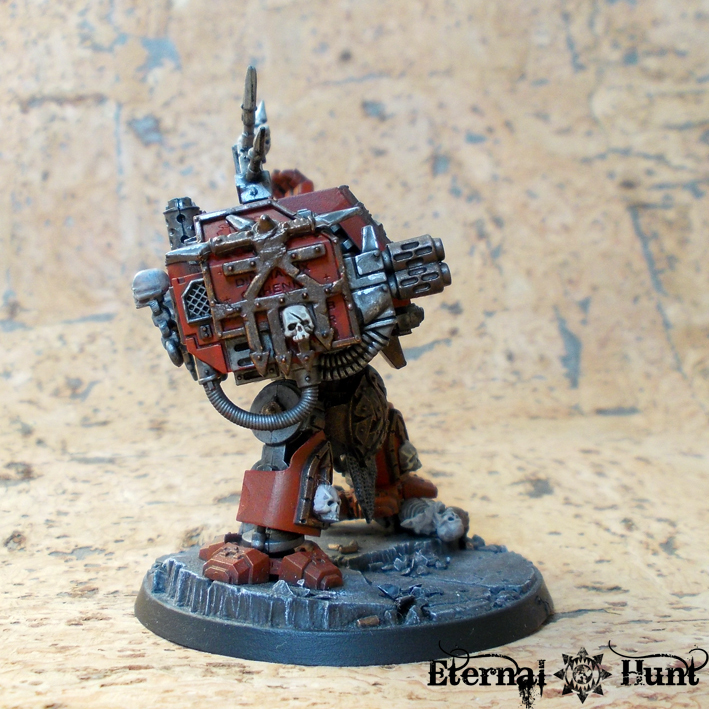 And the breastplate could be used for an Imperial Knight, with a tiny bit of bending. 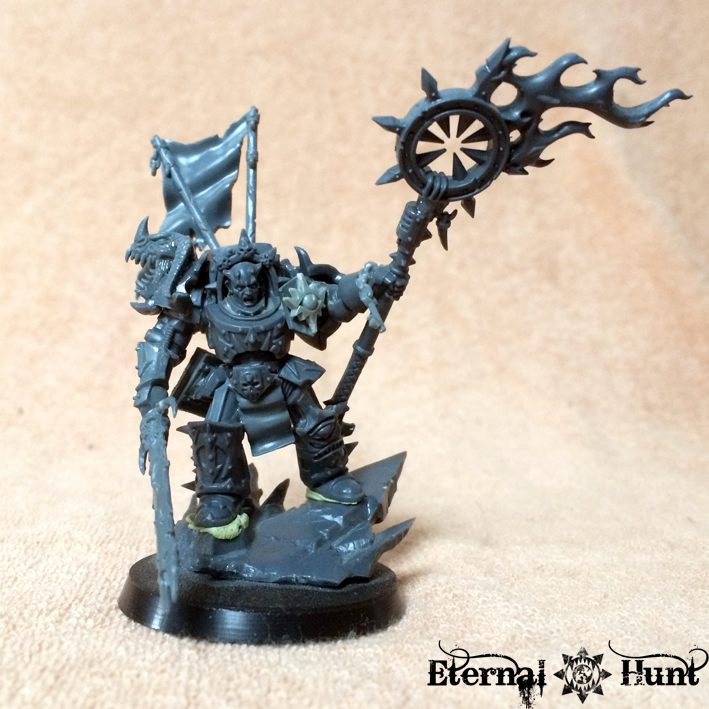 I think this would make for an excellent squad standard or a back-banner. 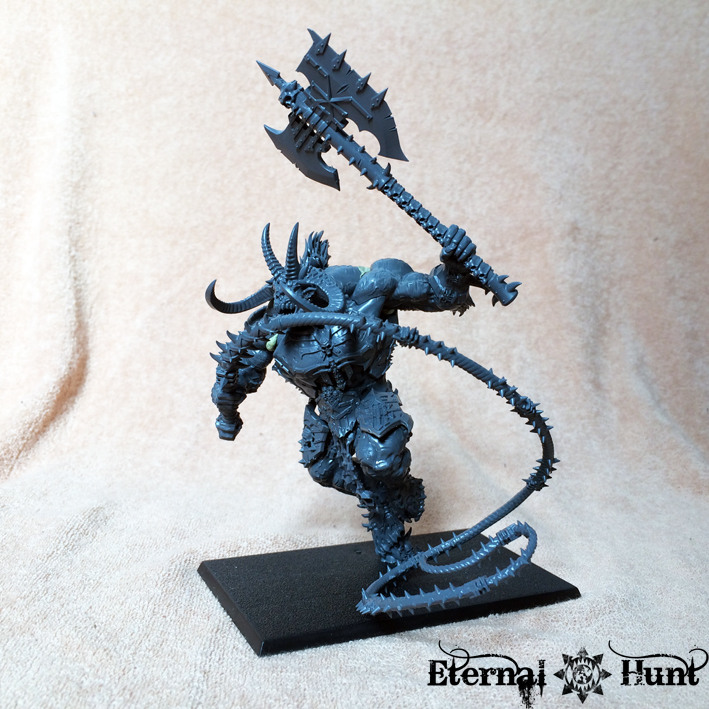 I also decided not to use it on my Bloodthirster, because I preferred a whip without a bulky object on its end, but the part is still very cool on its own. More on this in a minute! 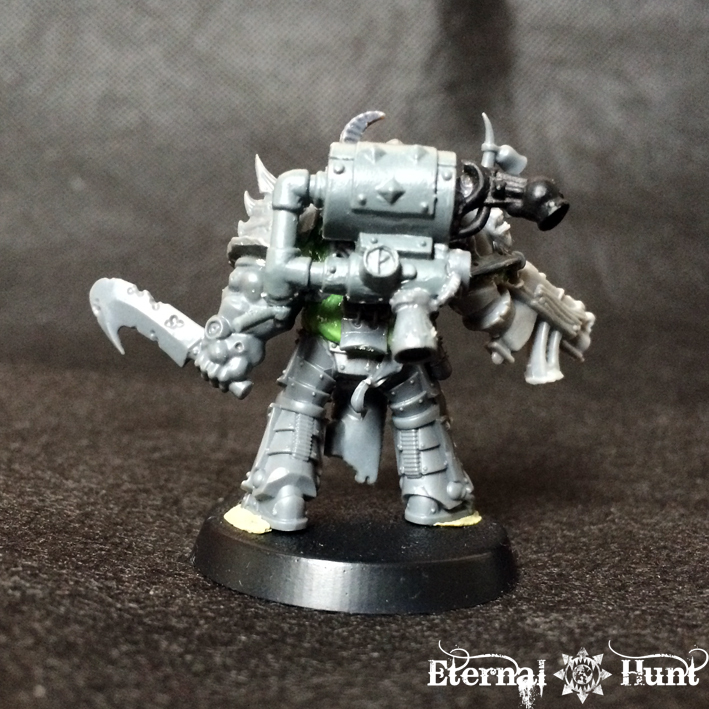 As you can see, it comes as a separate bit, so you could also use it on your DPs, juggernauts or even on a Terminator lord (it almost looks like the top of a Terminator torso front anway…). 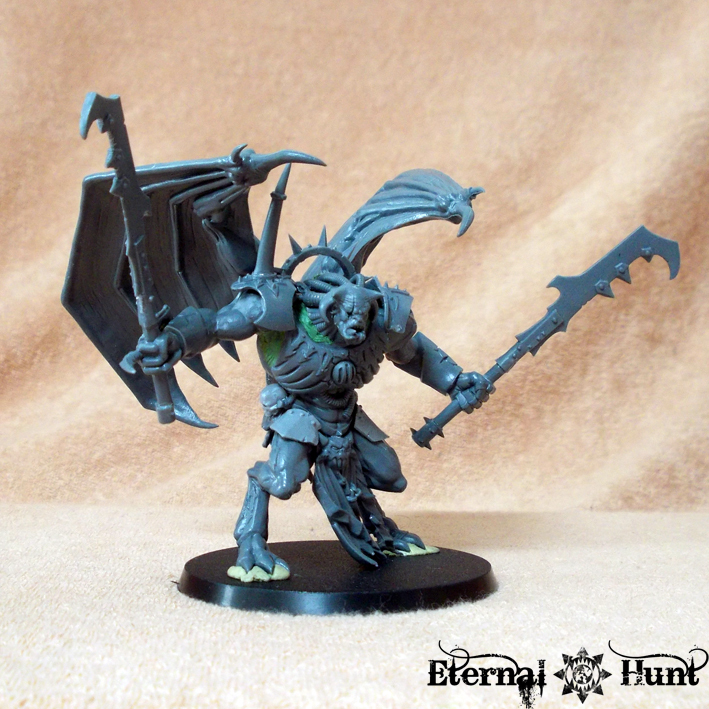 So, what about my own Bloodthirster, then? 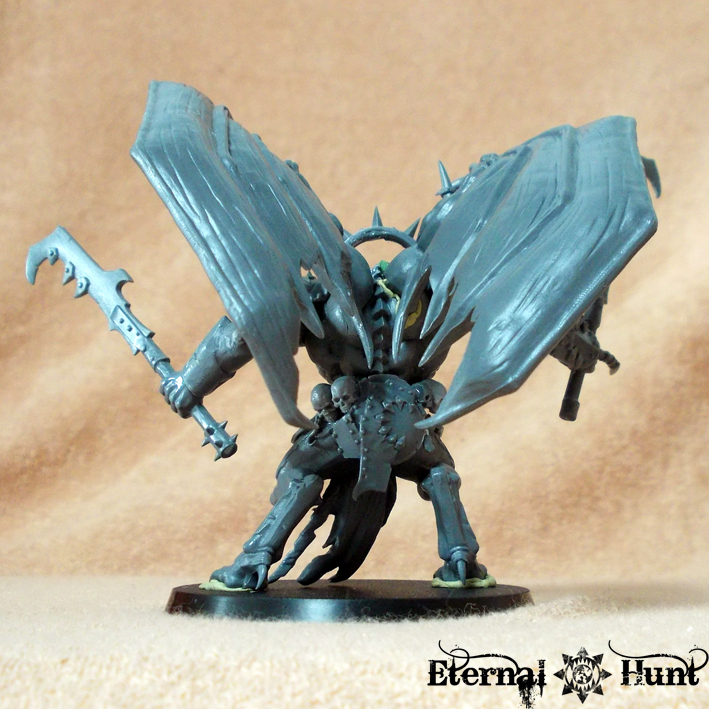 As you can see, this guy is fairly massive, even without his wings. I really like that! After much deliberation, I chose the asymmetrical axe head: While the other axe is beautifully designed, it just looks slightly wrong to me, held at that particular angle — more like the ‘Thirster is presenting it to the audience. The asymmetrical version doesn’t have that problem, at least not to the same degree, and looks like he is actually preparing for a swing, so it was definitely the way to go for me. 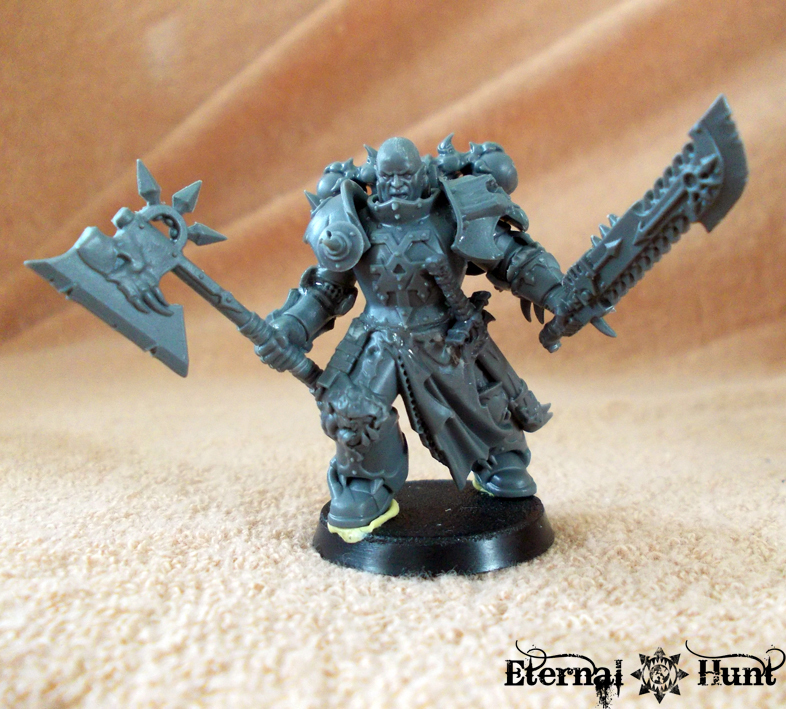 As you can see, it makes for a teriffic Crozius Maul for my Word Bearers Dark Apostle, Belzas Azalon (I also touched up the right shoulder pad, while I was at it). 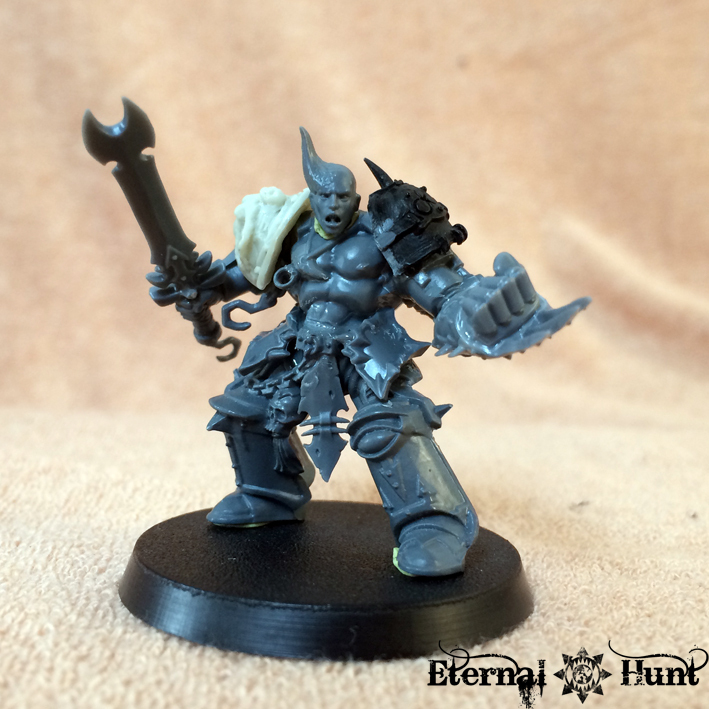 I have also started experimenting with the Wrathmonger/Skullreaper kit. 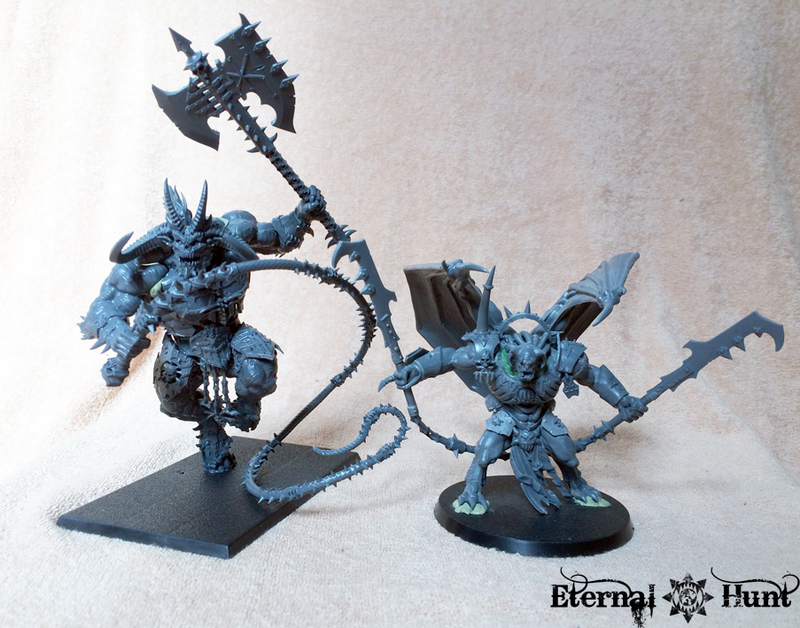 While the Wrathmonger may be slightly taller, the scale is still pretty similar — so similar, in fact, that parts from the Chosen will fit the new models without much of a hitch. 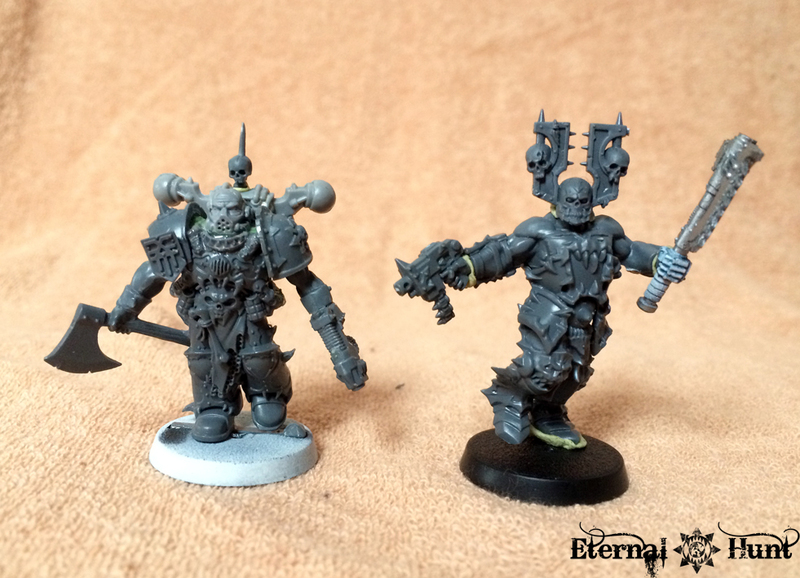 It’s also important to stress that the guy on the right doesn’t even qualify as an early WIP — I just tacked together some bitz, in order to show you the scale. Much better, don’t you think? 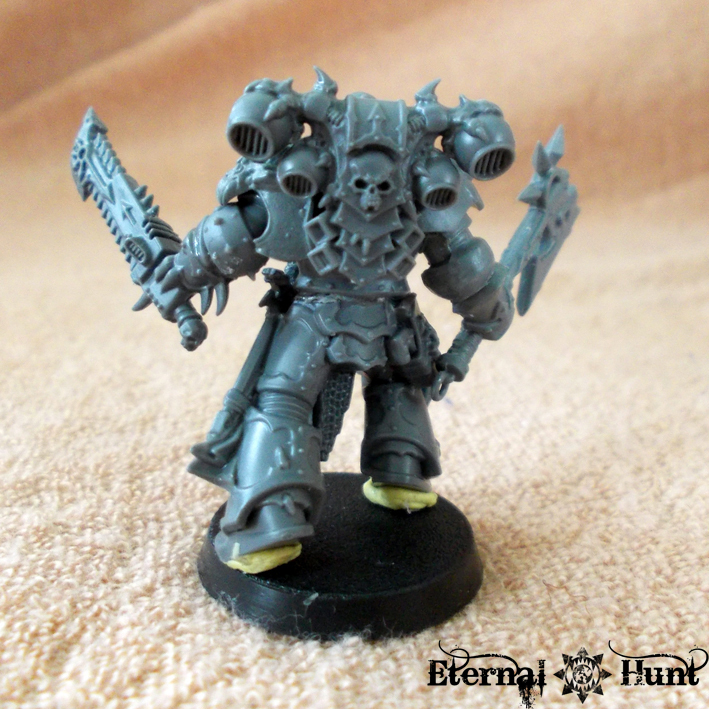 I’ve merely shaved off those stupid “cheek horns”, but now the head makes for a very fitting World Eaters berzerker! 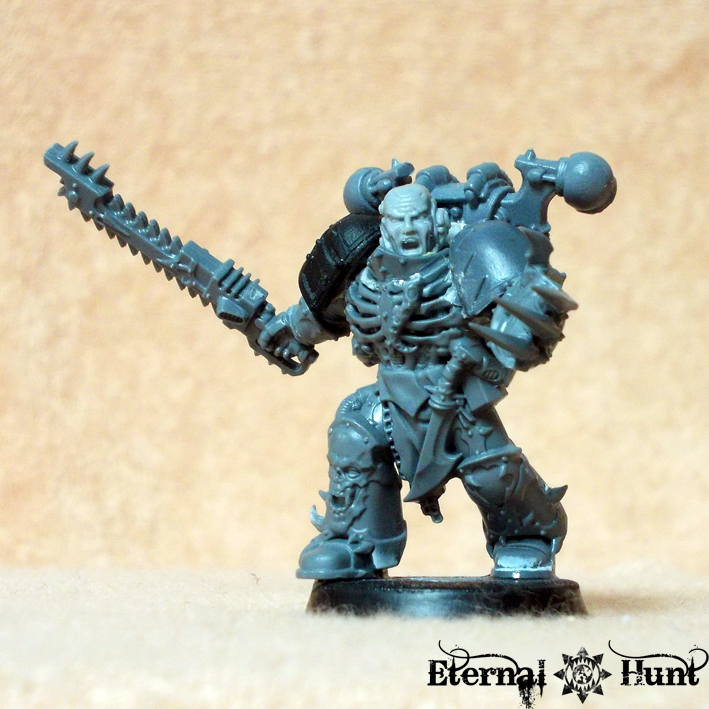 Oh, and one thing that really excites me is that you basically get twice as many torso pieces as you need: One set for the Skullreapers and one for the Wrathmongers. 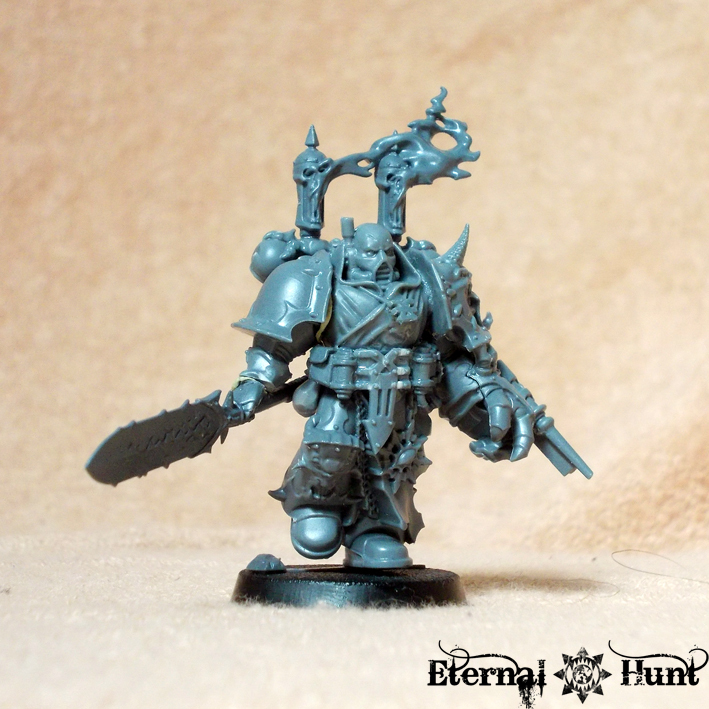 And each of those pieces has its own breastplate, which can be used as intended or cut apart to use on your other WoC/CSM models — all in all, this kit provides an enormous pile of leftover bitz for conversions, which makes it a pretty good purchase, if you are not totally disgusted by the look of these guys. 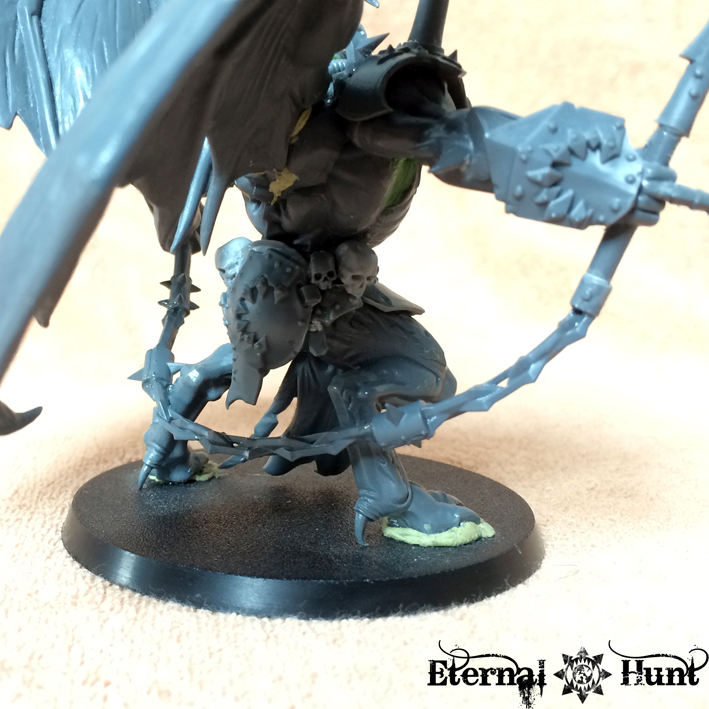 Everything’s just tacked together for now, in order to show you how well those Chosen arms work with the models. 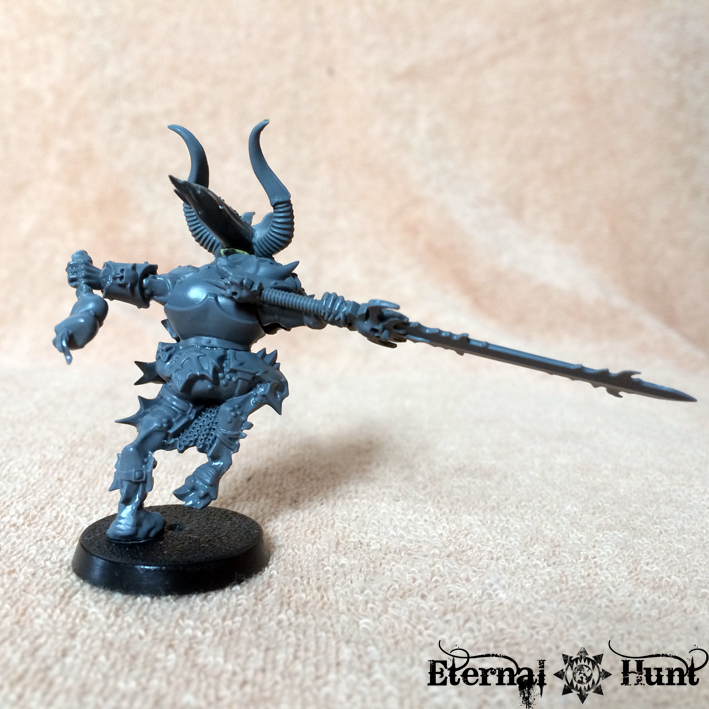 Once again, all the parts have only been tacked together with modeling putty for now, but there’s something suitably gladiatorial and feral about this guy that I like. 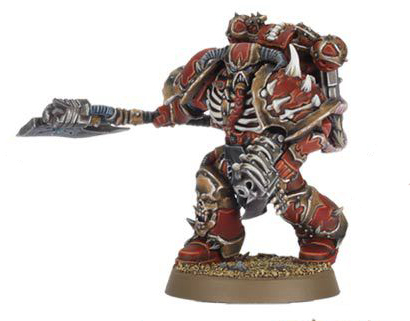 I also think the model serves as proof that those leftover Wrathmonger chests can really be put to good use! 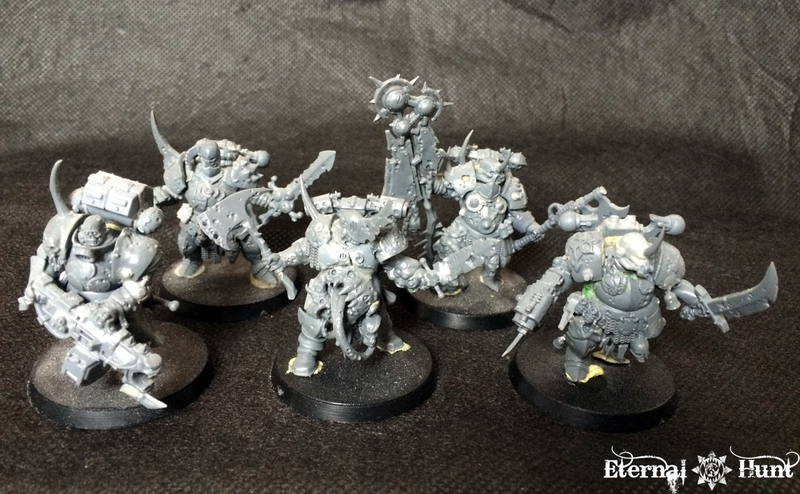 So the best approach would probably be to save the Wrathmongers/Skullreapers for unit champs, Chaos Lords etc. 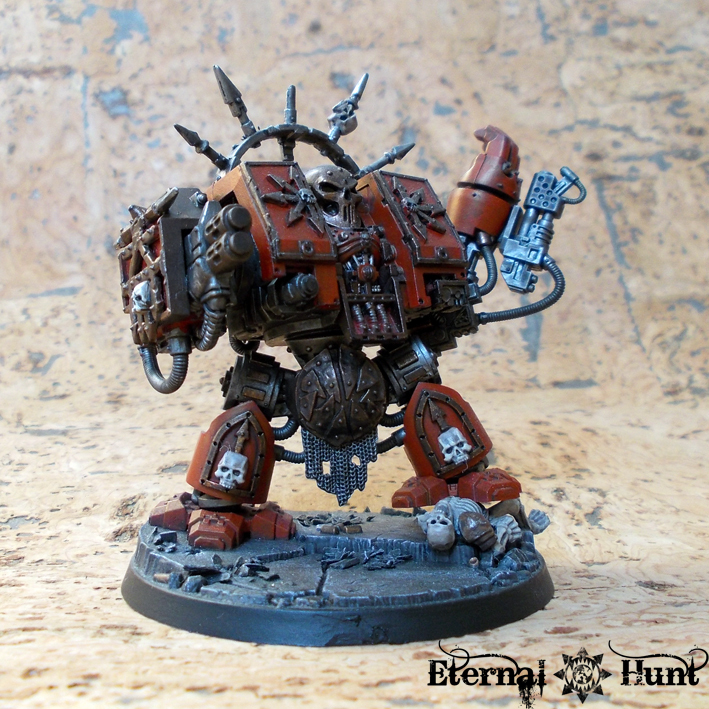 Or you could choose an approach similar to that of Wonkobaggins and use the Skullreapers as counts as chaos spawn and/or Red Butchers. Check out his first experiments with the kit here. 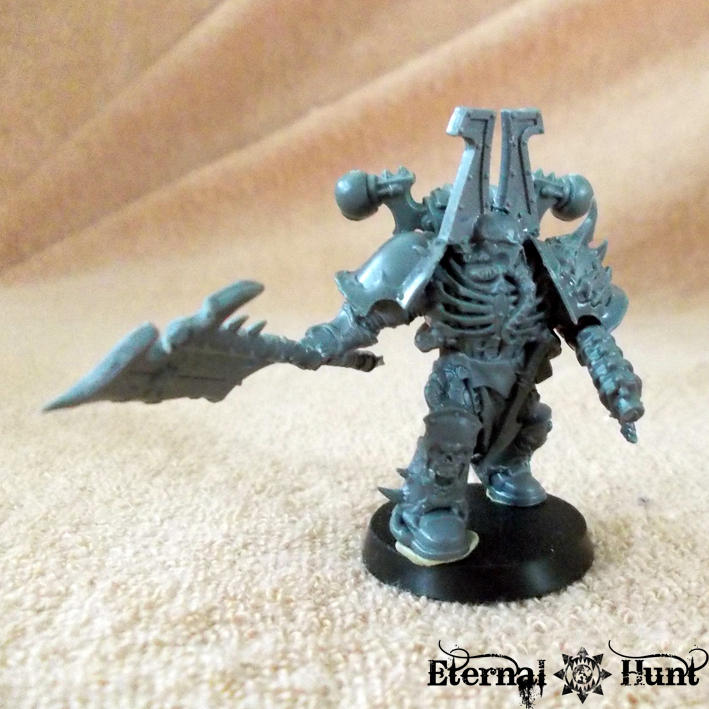 All in all, this has been a surprisingly easy conversion: Most of the model is simply a stock Skullreaper, with the arms and head replaced with Bloodletter (and Bloodcrusher) bits. The body already has the characteristic, pocked skin, so it looks like it belongs to a Bloodletter anyway. 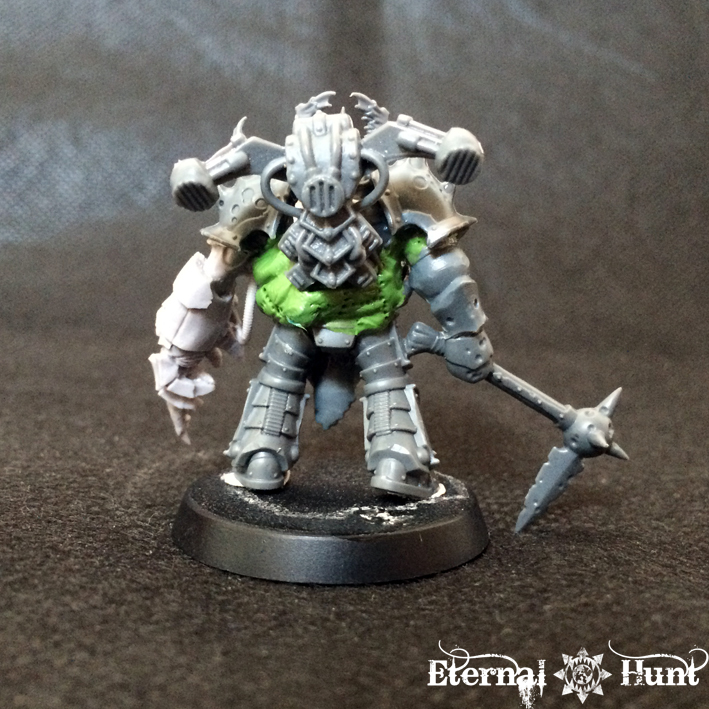 And the armour is jagged and organic enough to pass for daemonic, don’t you think? 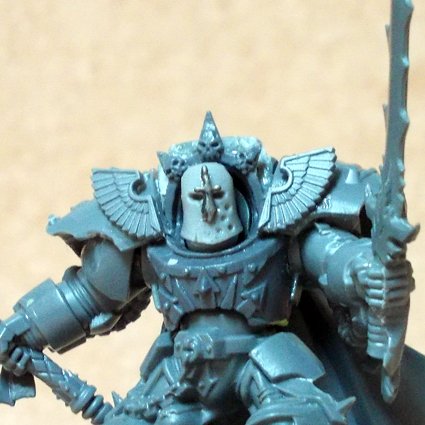 One thing I did was to graft on a Bloodletter neck, so I would have a more natural way of attaching the head. 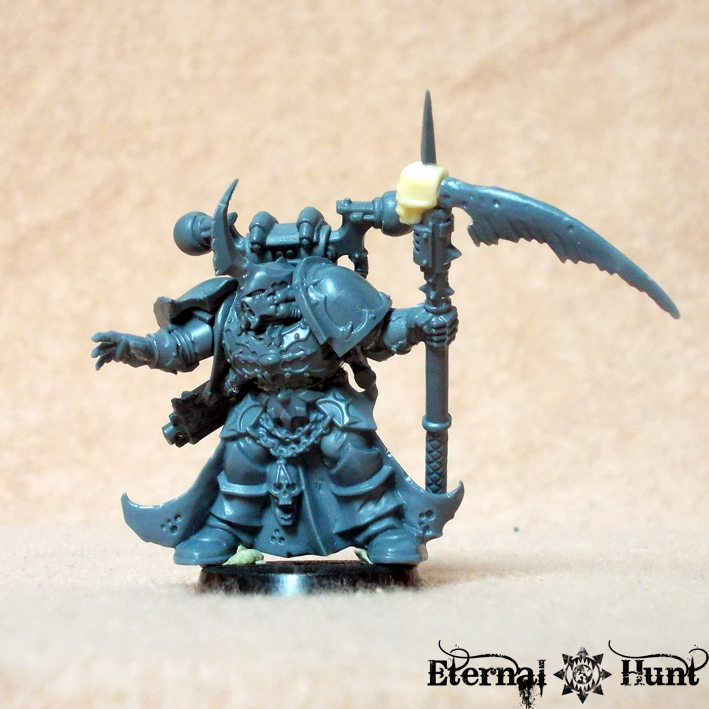 Mol informed me that this conversion is actually about ten years old! 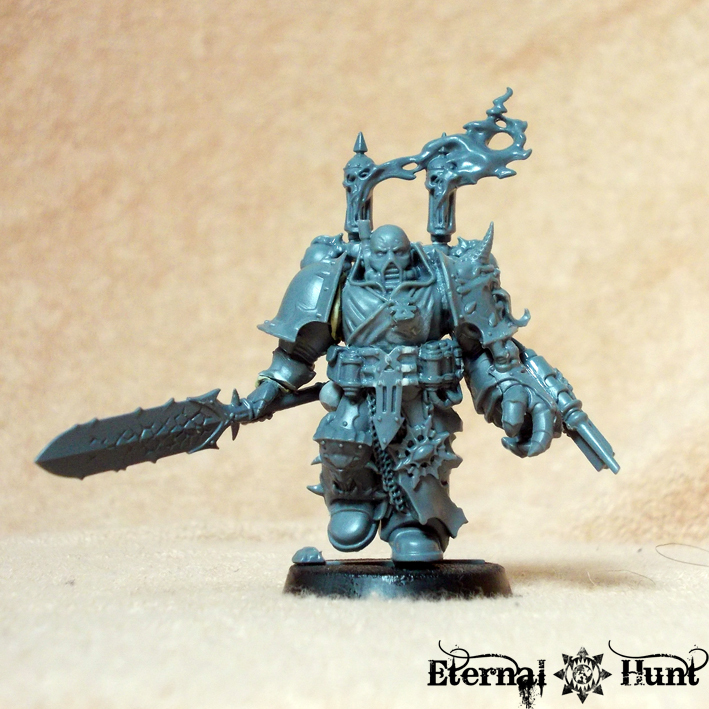 Which goes to show that good, clean conversion work never goes out of style. 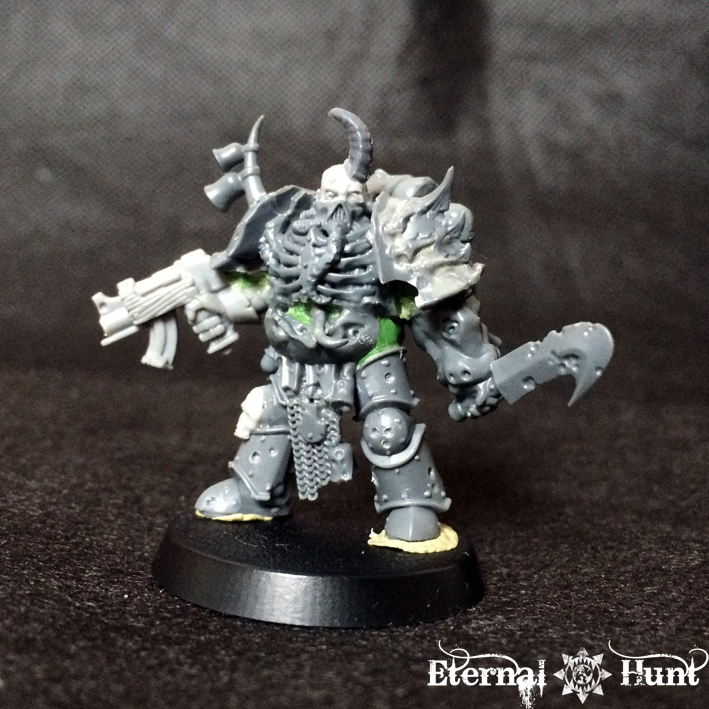 It also goes without saying that I’ll make sure to paint him up to the best of my abilities, in Mol’s honour! As you can see, most of stock Huron’s characteristic elements are there — I even got a bit of a kick out of having the model in a pose similar to that of the stock model, albeit more dynamic. 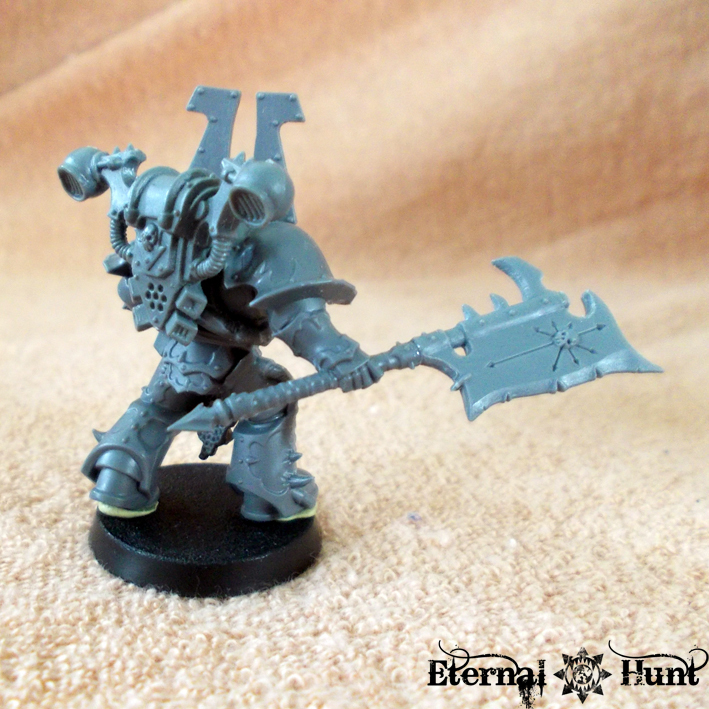 Oh, and let me just add that the axe was inspired by a similar (albeit much more elegant) weapon conversion done by Biohazard! 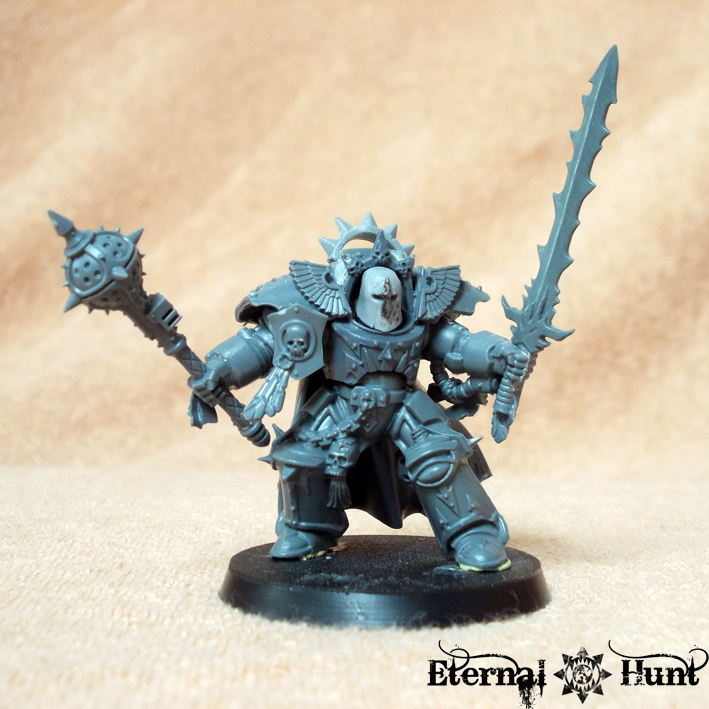 All in all, I wanted this model to look like a brooding black knight figure, and I think I can consider that mission accomplished, don’t you think? 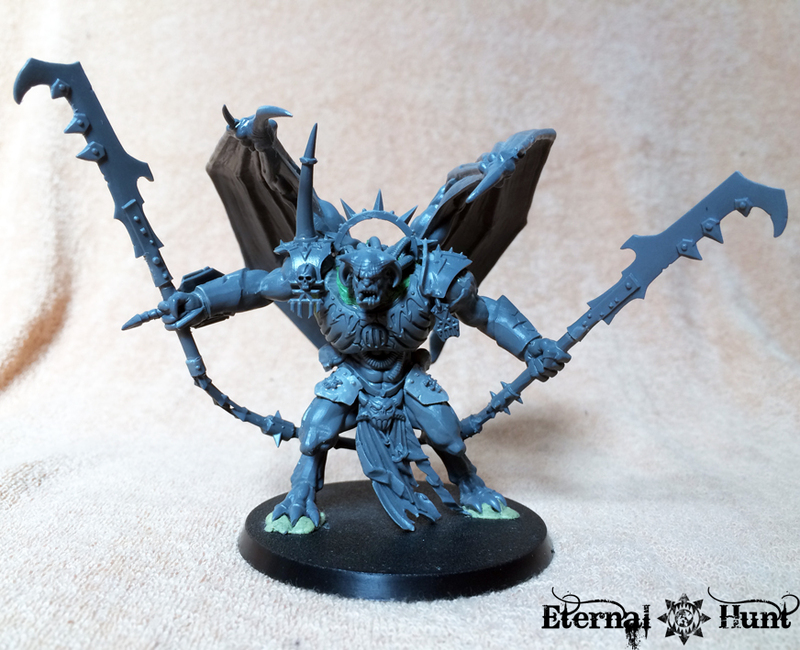 I am really very happy with this model, especially since I wasn’t really sold on the stock Daemon Prince kit as all — but now, I think that the kit can really be reworked into something rather cool with a bit of thought and an influx of suitable bitz!. 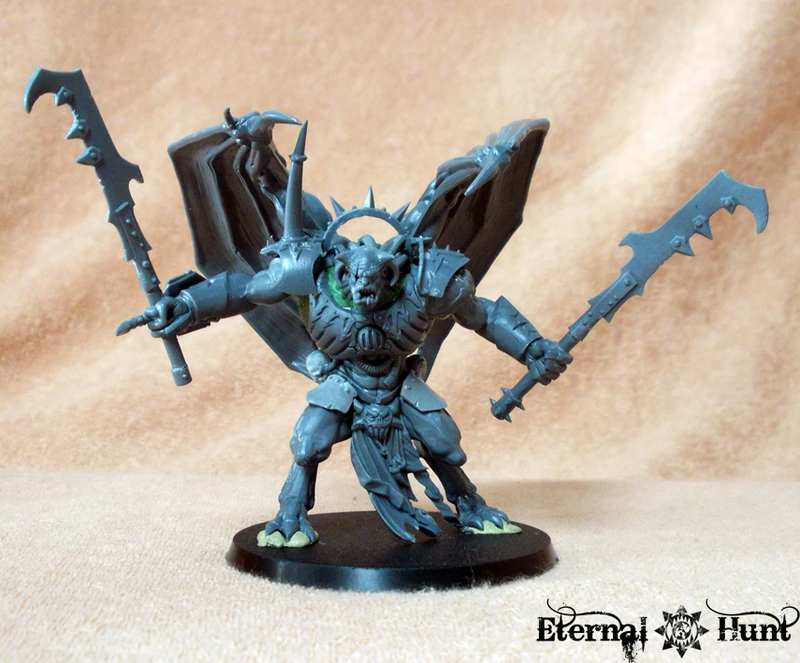 I’ll also likely keep the wings, because I like the added bulk and presence they create — plus I already have a wingless daemon prince, so having both options in my collection seems like the sensible approach here. 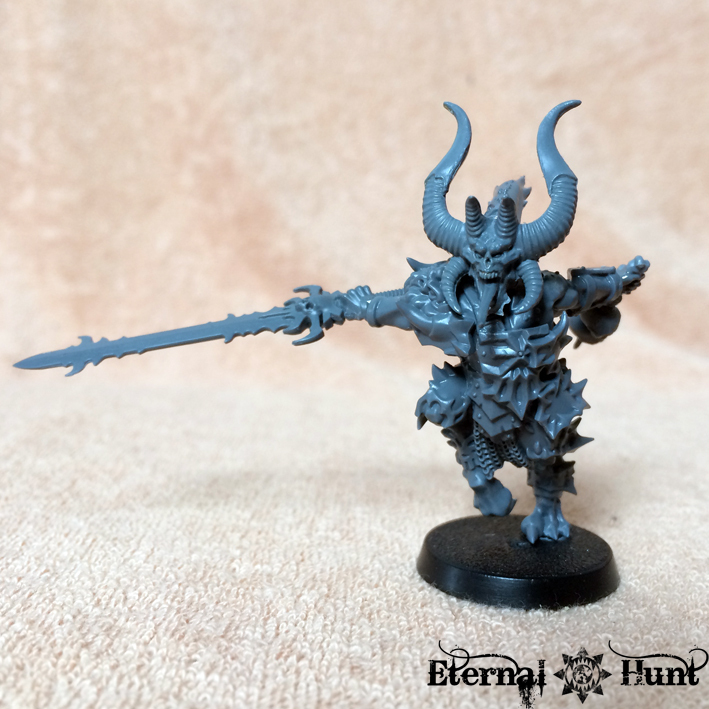 Those of you who have been following this blog for any measure of time will know that I love building new characters for Khorne’s Eternal Hunt. And I like coming up with models that work both as a character as well as a special unit type — even in those cases where it doesn’t even make that much of a difference from a rules perspective. Case in point, my recent project to convert the 4th assault company’s Apothecary: Sure, Apothecaries cannot be used in CSM armies, but I’ve had a couple of ideas regarding this character’s background for a long time, and I think an Apothecary would be instrumental to the 4th assault company’s attempt at keeping corruption and madness at bay. 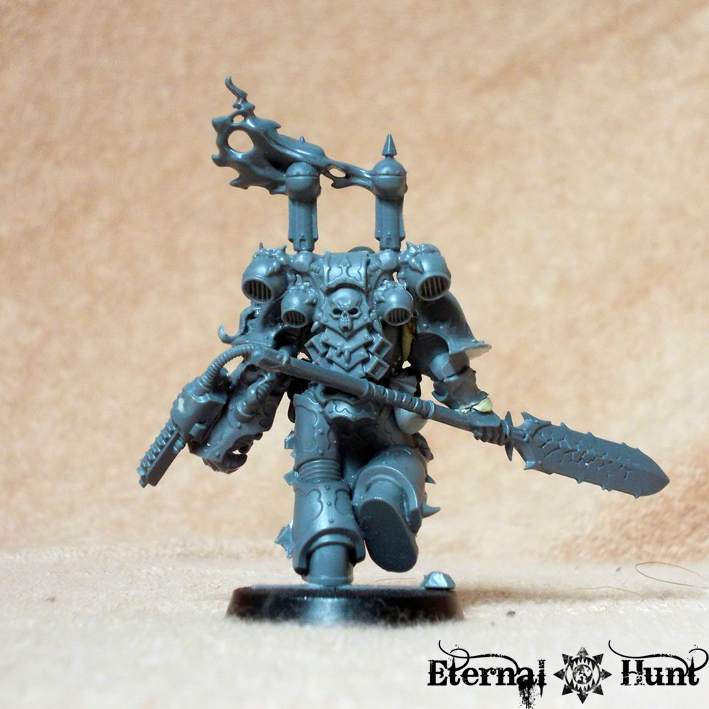 Dumah was created by combining the upper half of a Ravenwing biker sergeant from Dark Vengeance with the legs from a CSM Chosen from the same kit. I wanted Dumah to wear a robe, both as a sign of office as well as an element resembling a slightly sinister, Grim Reaper like figure, and this particular combination of parts allowed me to create the intended effect. 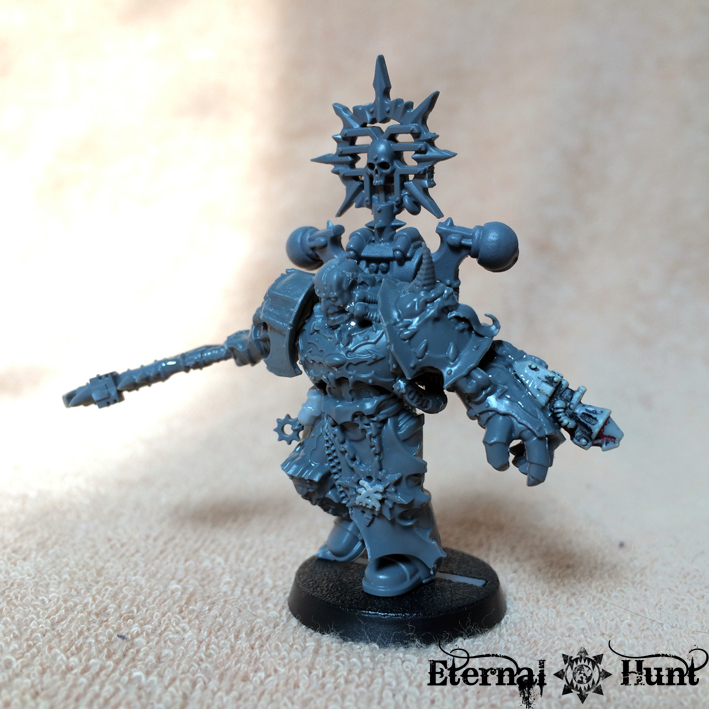 The left arm with the Narthecium gauntlet came from the same Chosen, with the tools from a GK Terminator Apothecary added to the powerfist (a surprisingly good fit!). 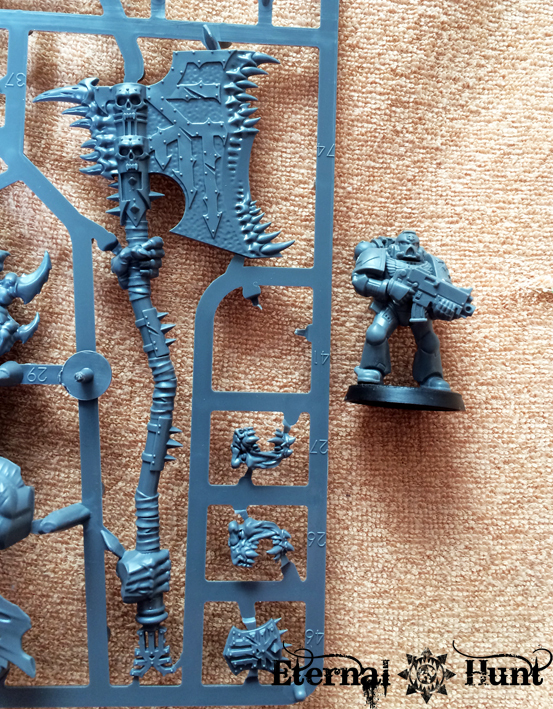 The left arm came from a different Chosen model (I really went all out on this guy), with a spear from the WFB plastic Chaos Lord. 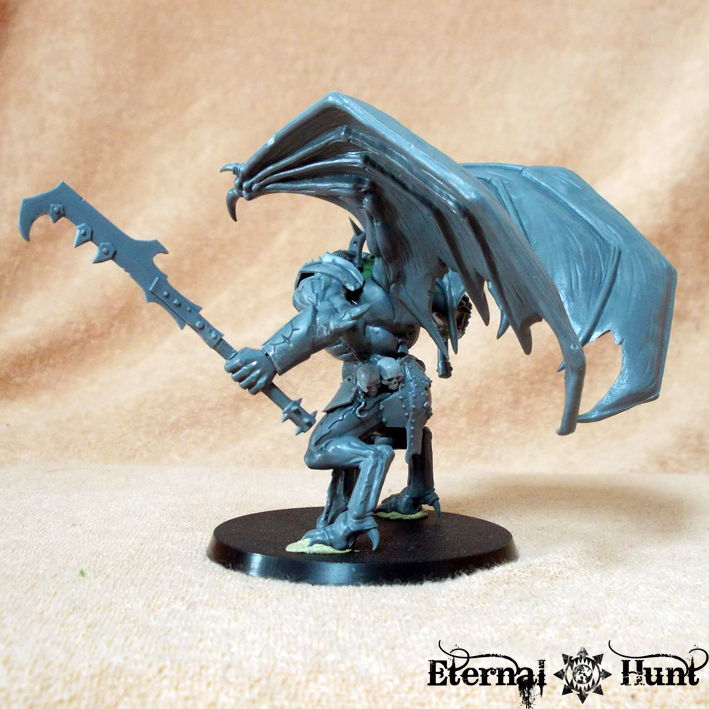 I’ll admit the spear was a bit of an experiment: The first idea was to give Dumah a scythe (for an even more Grim Reaper like look), but that didn’t really work all that well. I did want a weapon with a longer handle, and his epithet “Chooser of the Slain” made me think of the mythologic character that goes by the same name: Valkyries. Hence the spear. All in all, while Dumah turned out quite different from what I had originally imagined, and while it was a rather fiddly conversion at first, I am still immensely happy with the outcome: Dumah can certainly hold his own against his fellow Huntmasters from a coolness perspective, and I think he has a focused, slightly sinister look that perfectly fits my idea of his character. 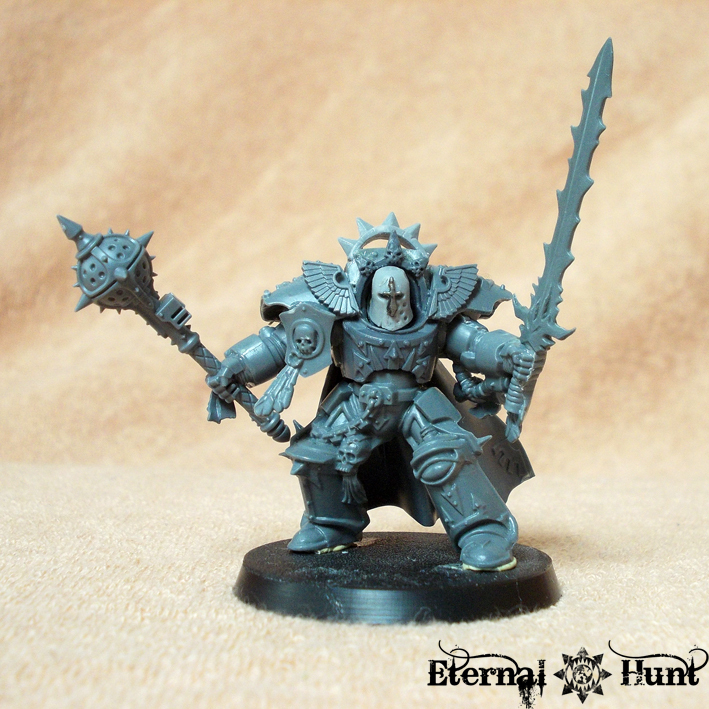 Come to think of it, he could probably be used as my own version of Fabius Bile, don’t you think? The battle tide was ebbing for a while. In the distance the mortars were still thundering, their rythmic bass accentuated by the staccato of rapid-fire. Like lost souls, the high-pitched artillery artillery grenades screamed. The rustle of the brazen forest, the fiery rain on the scarlet fields. One of his more introverted squadmates had once written a sonnet about it in the long silent hours of the Between, while the battle barge plunged the void from one hunting ground to the next. On this side of the battle fields there was another such a moment between. Maybe that was the reason his thoughts went this direction, Zighurt mused. The fury in his veins had ebbed now, like the battle around him. Soon it would rise again, and he would be on the hunt once more, drowning the world in a tide of crimson and fire. The tip of a spear,thrown from behind, protruded from his chest. Zhigurd looked down in wonder. Then came the pain. Slowly the now liveless carcass tilted forward, his tribute to his god spiraling into the depths of the pond, Already the water had turned to pink. 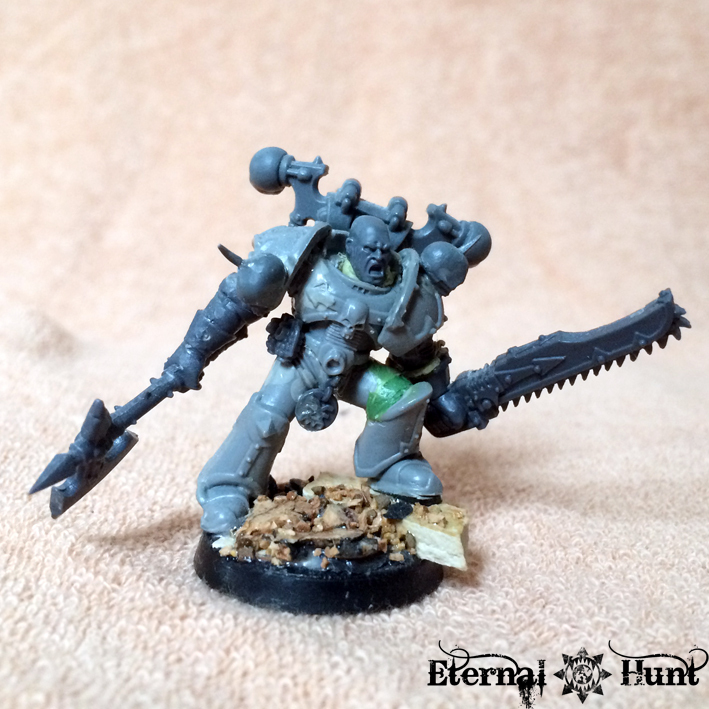 From the shady glen another marine emerged, also bearing the mark of the World Eaters. His boot came down on Zighurds back, then with a decisive pull he retrieved his spear. Hagen looked down on his prey. “The hunt never ends, Zighurd. 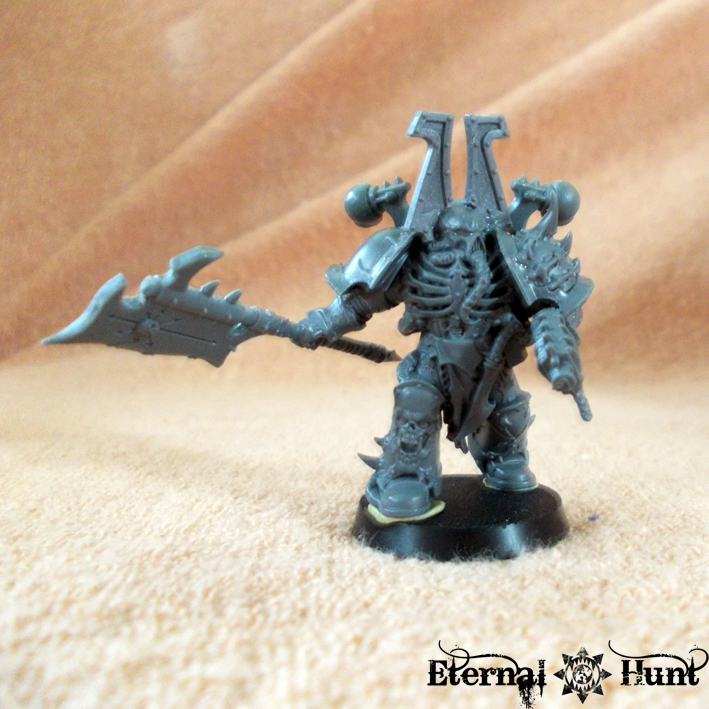 Khorne WILL have your offering, He will not allow you to diminish it by dwindling away!” This was the way of the hunt. The predator would rise in it’s terrible glory, gathering strength and cunningness, until it was on the zenith. Then inevitably would come the moment of weakness. The former king would fall, would turn prey to it’s rivals, maybe end on the antlers of a not-so-easy kill or just find out there was always a mightier raptor. A good hunter would spare the glorious ones the humilation of the decline. 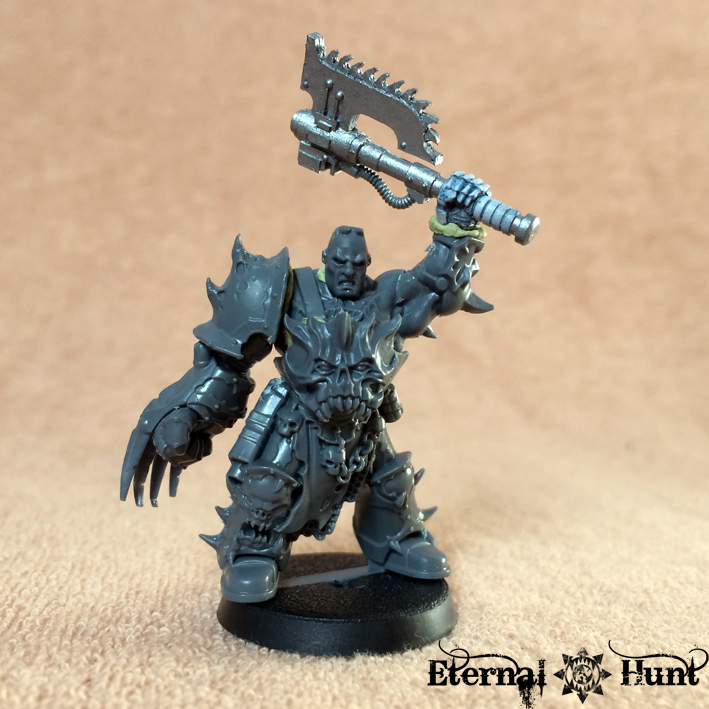 Hagens glovesaw screamed, as he took the legion’s toll, then what belonged to his grim God. 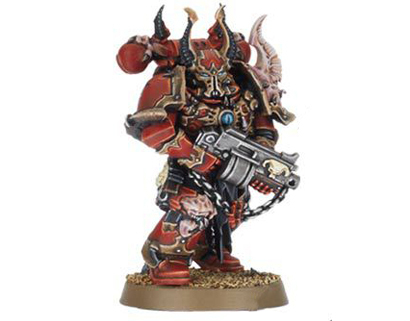 “Blood for the Blood God” the Apothecarius intoned, dipping his index into the hole he had driven into Zhigurds power armor. 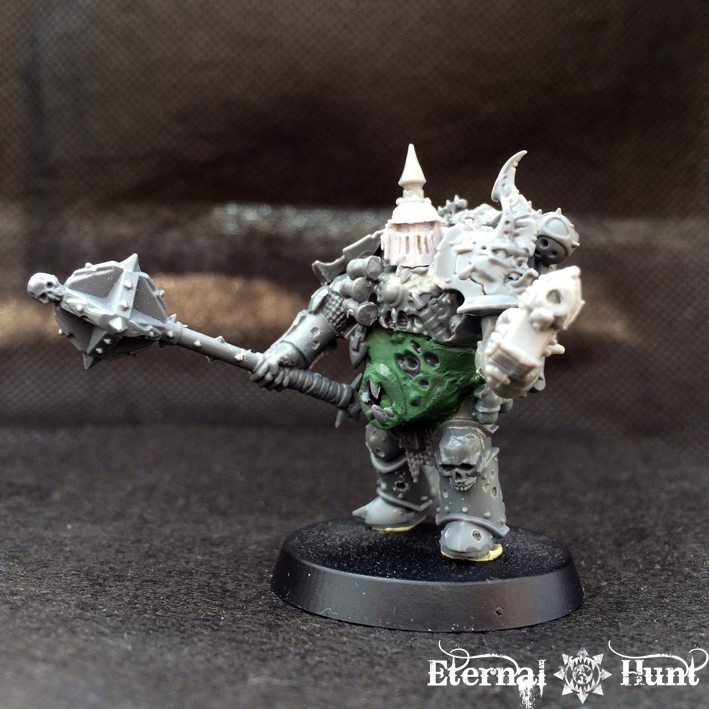 “Skulls for the Skull Throne!” he completed the invocation, while he drove his spear into the detached head of his former comrade. Without looking back he walked away, his macabre trophy staring into the skies from broken eyes. Now while my own ideas for Dumah are somewhat different, I still thought this a great read and wanted to share this with you. Thanks a lot, Hruotland! 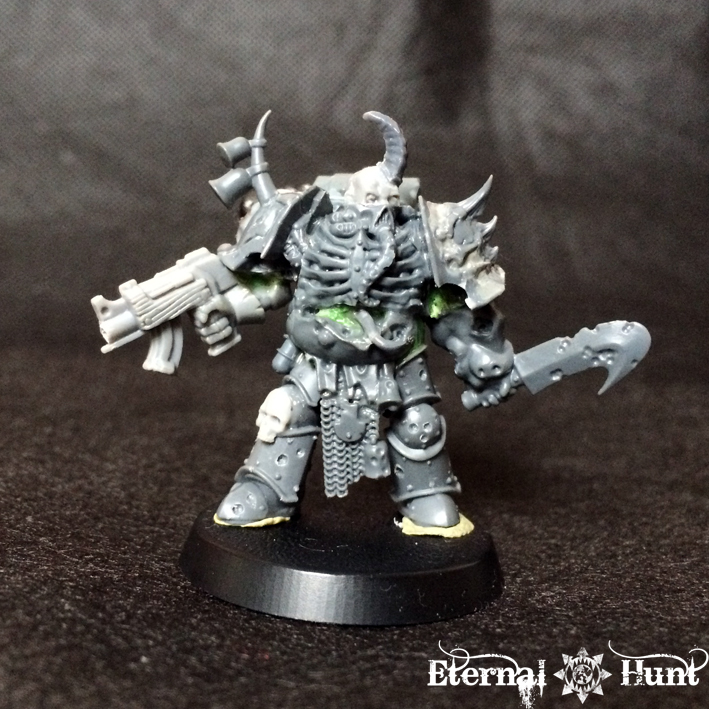 As you should know, I am a huge fan of shoutly bald guys in my army, but I also like the “faceless killer” look created by the second helmet — which version do you prefer? 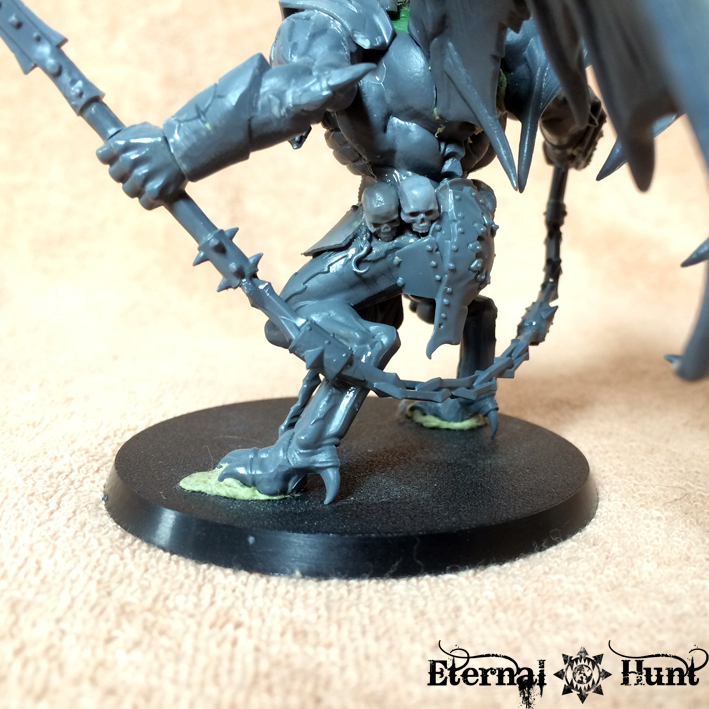 This model is a personal favourite of mine at the moment, because it really started out as a happy accident: Combining the body and legs was just me messing around, but I am really happy with the result. I think he’ll make a great leader for them! 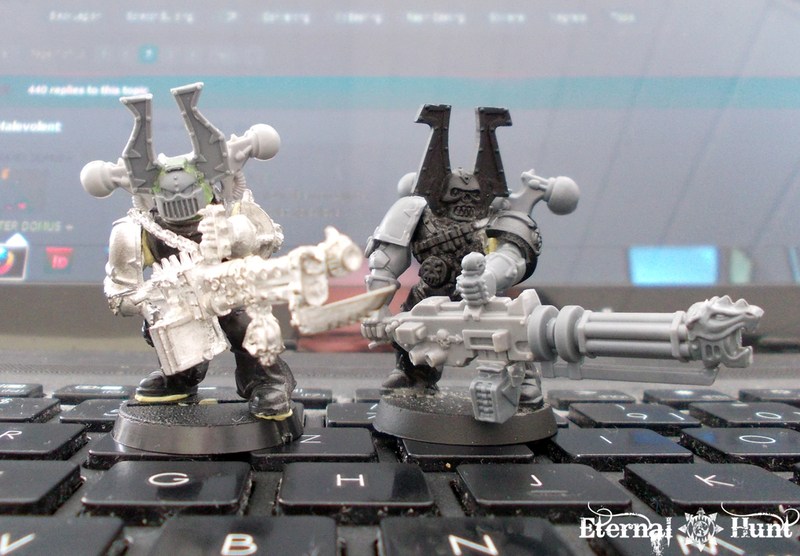 Anyway, I hope you like my new chaotic kitbashes! Please let me know any suggestions or feedback you might have! And, as always, thanks for looking and stay tuned for more! 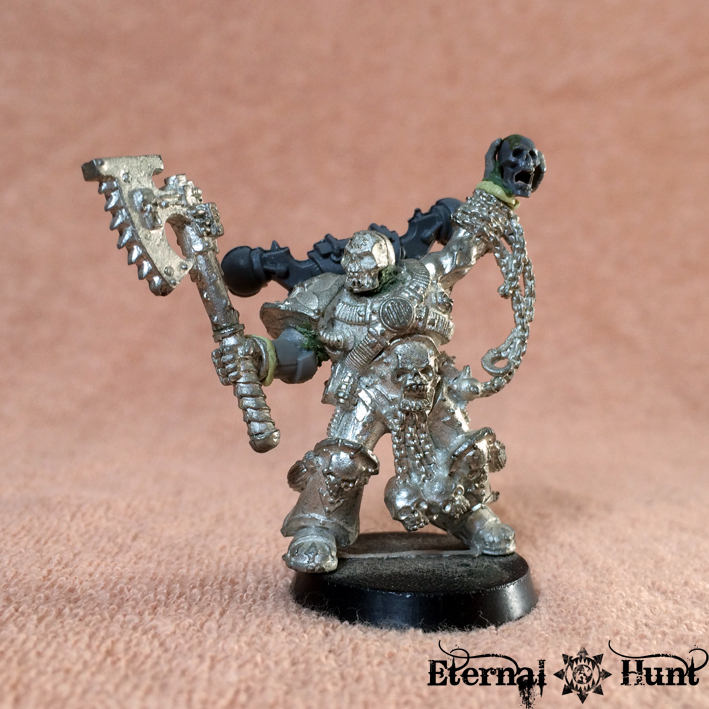 While I am itching to paint some of the models I have recently converted, the high temperatures all around have rendered painting all but impossible for the last week or so. Fortunately enough, the temperature has dropped a bit, and it looks like I can finally get to work at the weekend. Huzza! The guy on the right is a good example for that. 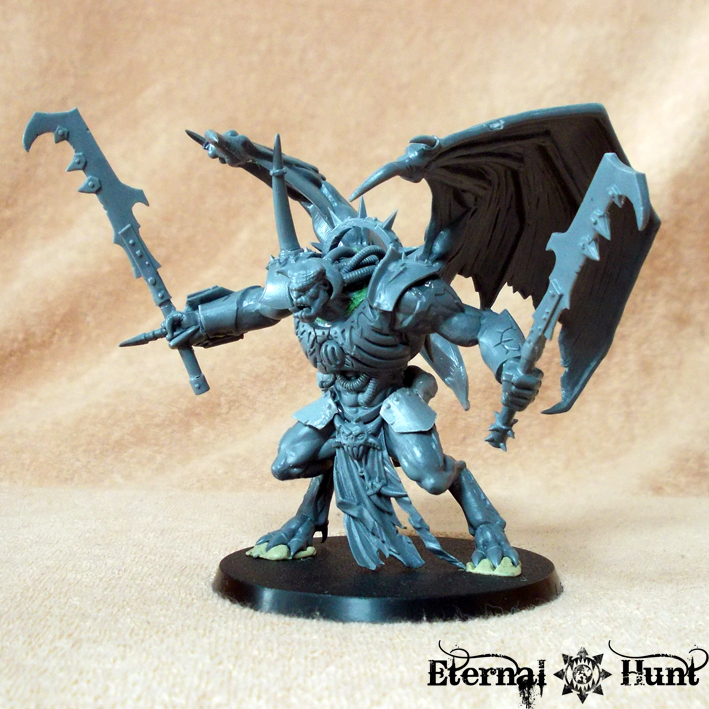 Some Raptor parts and additional trophies were added to him to bring his look more in line with that of the ultra-detailed Dark Vengeance model on the left. 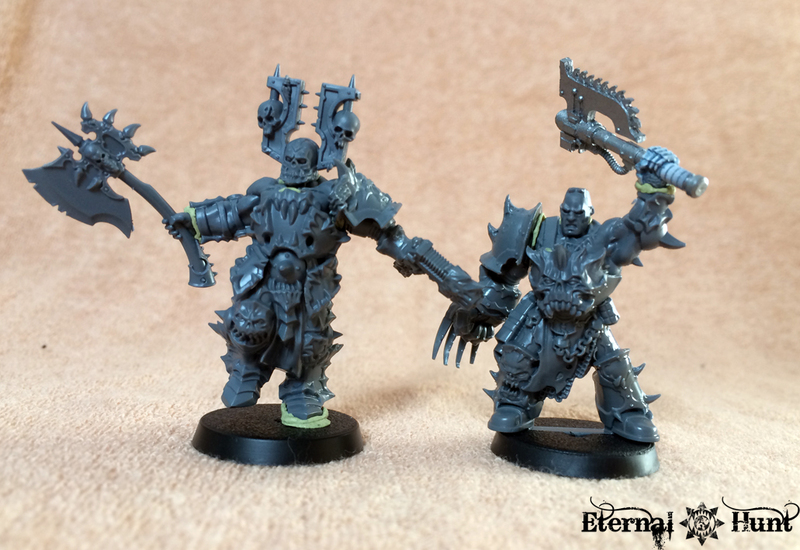 These two guys were also touched up, with the Chosen on the left receiving a new right arm, shield and some trophies, while a highly detailed set of Khornate “bunny ears” (from the WFB Skullcrushers) and a severed head were added to the gentlemen on the right. 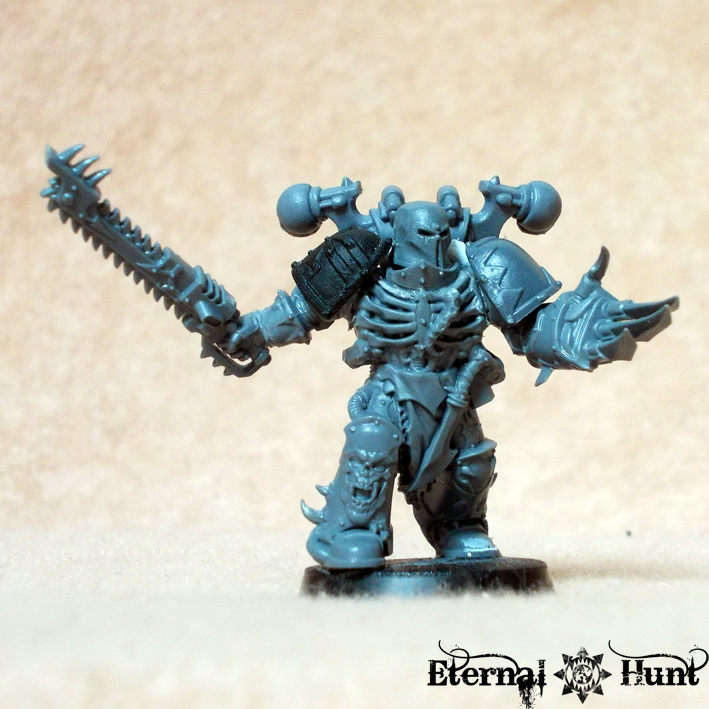 A recurring visual motif for my Chosen is that they are channelling both the legion’s gladiatorial origins as well as the 4th assault company’s role as a hunting party, so there are several visual cues to both ideas (the bare arms, the slightly gladiatorial equipment and the amount of trophies, for one). I am really pretty happy with these guys, because they now hold up quite a bit better when seen next to the Dark Vengeance Chosen. 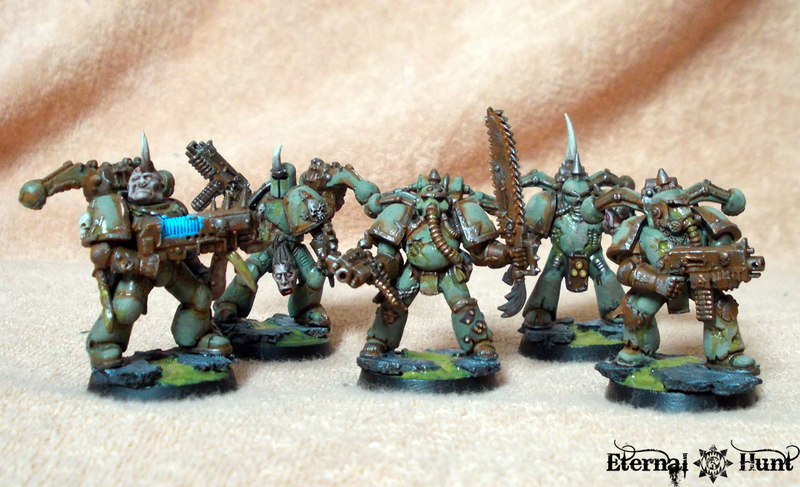 Another ongoing project of mine is the construction of a squad of Khornate Havocs. 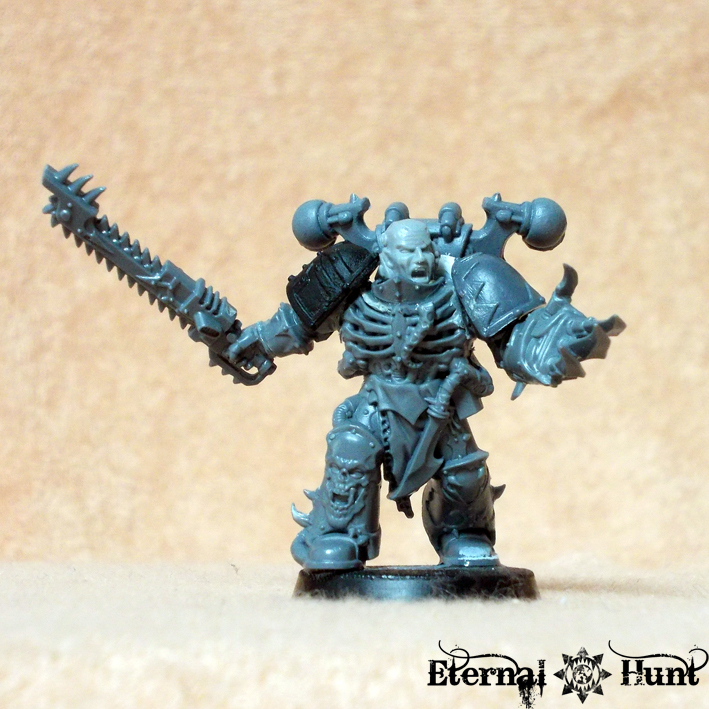 There used to be a time where not every member of the World Eaters was described as a raving lunatic completely addicted to combat at close quarters. 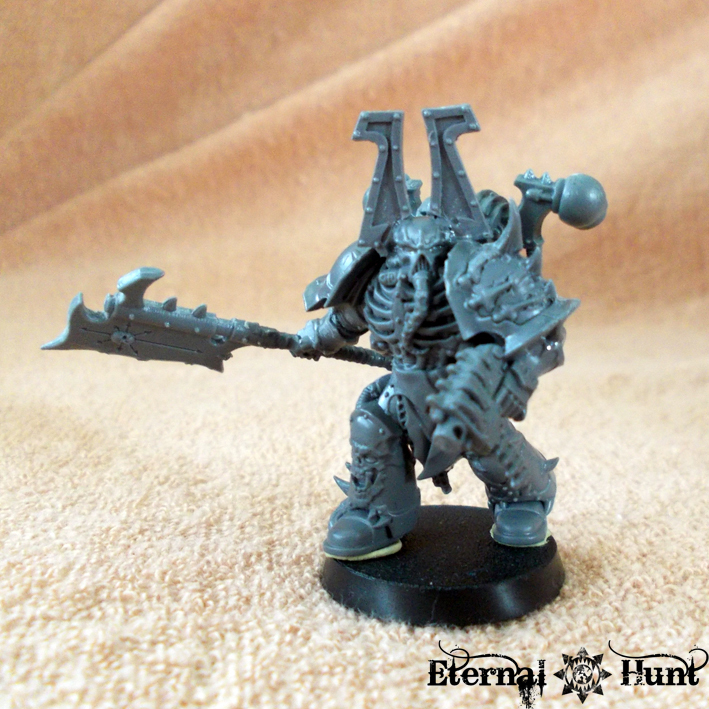 There were also the “Teeth of Khorne”, the legion’s dedicated long range support troops. 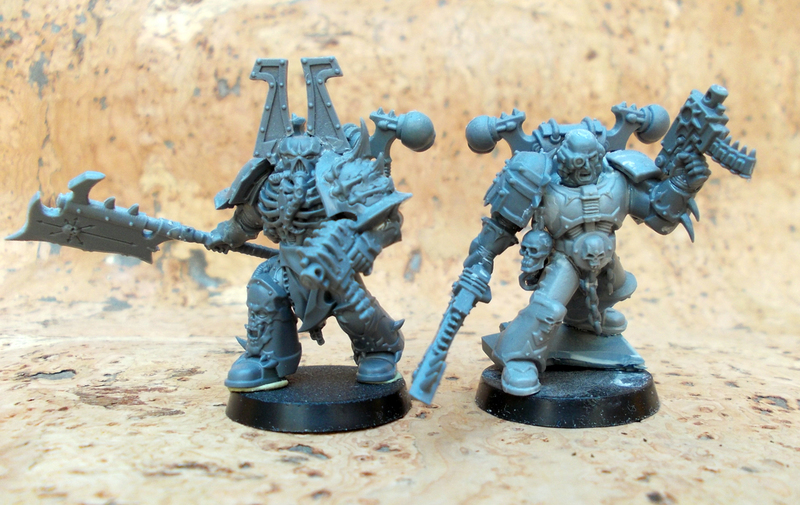 And since the 4th assault company tries its best to function as an at least slightly varied force, it was clear to me that building a dedicated squad of World Eaters wielding big guns could be a fun conversion project. 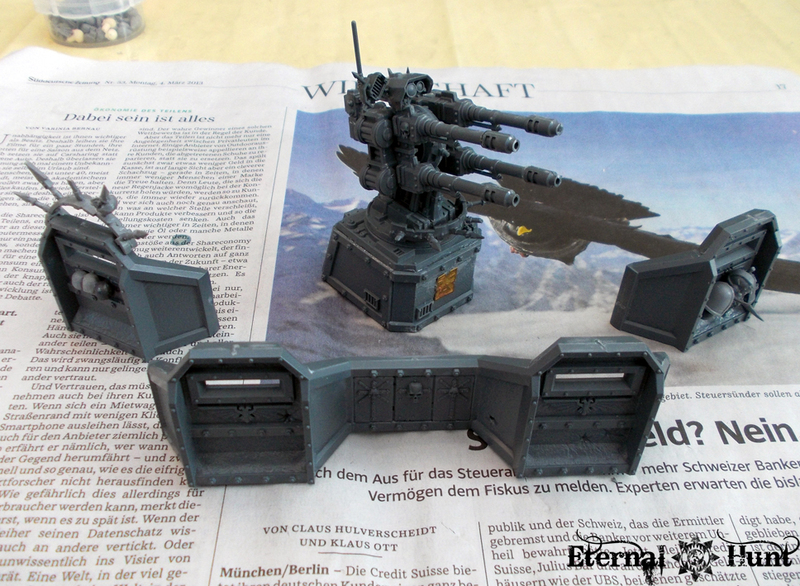 Some of the armour plates from the chaos vehicle kits are a perfect fit for the Aegis Defense Line. 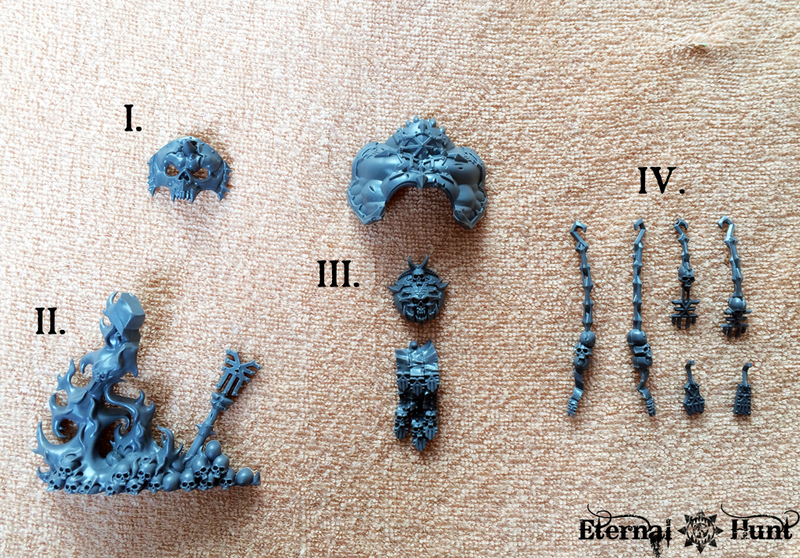 All the aquilas will have to be shaved off (which is quite a bit of work) or covered with bitz, though. 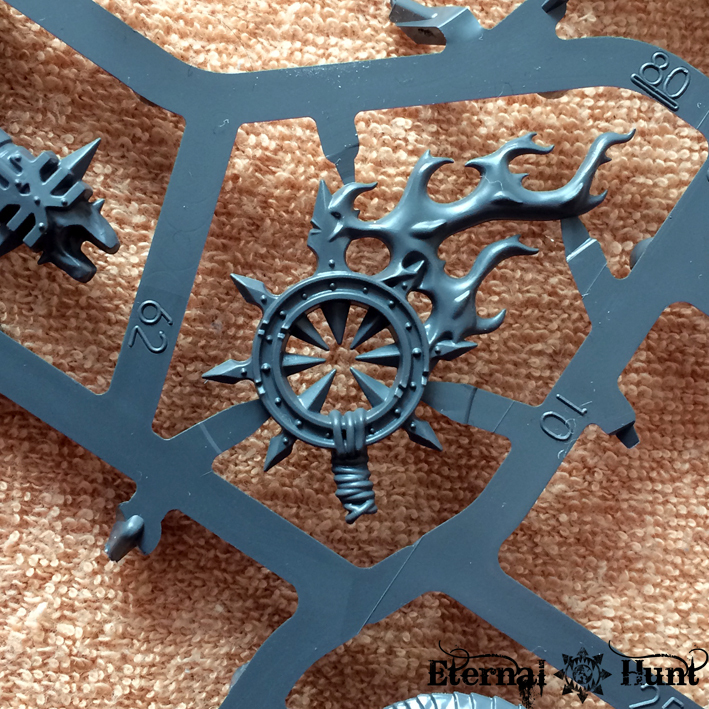 The Hydra Flak Cannon was in a pretty sorry state when I got the kit, so I mainly contented myself with cleaning it up and adding a spiky bit here and there (as well as a brass icon of Khorne at the base of the weapon). 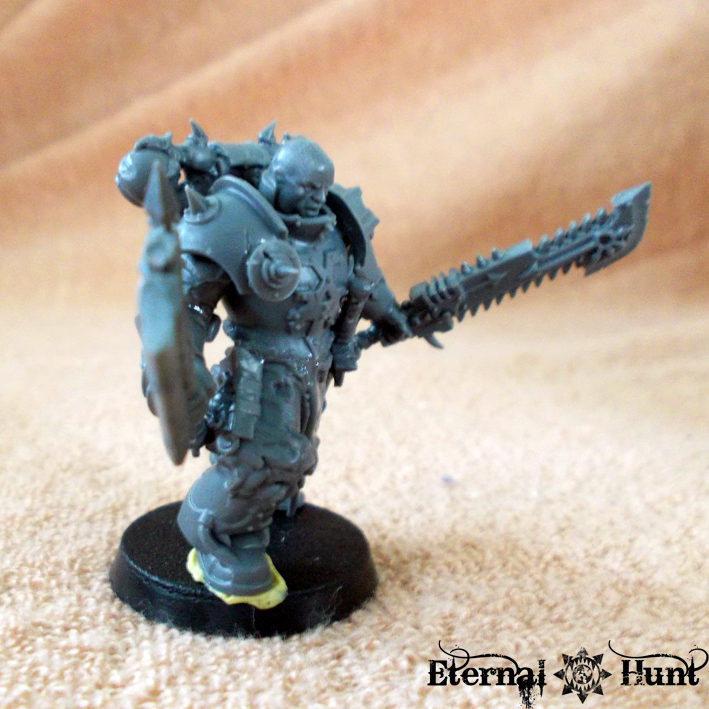 I also experimented with adding a Space Marine torso, impaled on the front of the wall. Getting the fortification completely sorted out will be quite a bit more work, but it’s a fun little kitbashing project that can keep me occupied when other activities are not an option. So, while the weather has prevented me from tackling some of the bigger painting projects, I have been far from idle, as you can see. And with the temperatures returning to normal now, expect to see some rather interesting pieces soon-ish. Until then, let me know what you think! And, as always, thanks for looking and stay tuned for more! 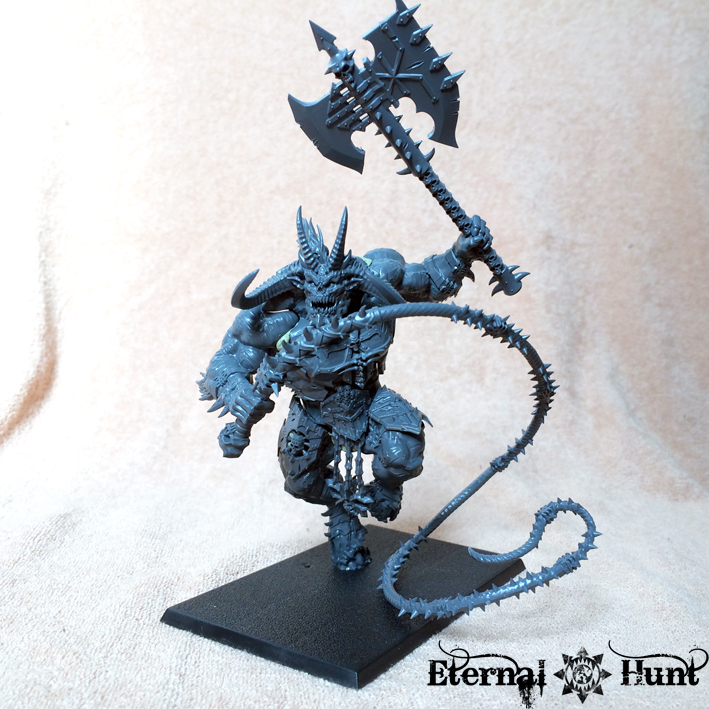 You have to hand it to GW: That Dark Vengeance boxed set is quite a lot of bang for the buck: I’ve been happily cutting away on those models ever since the box was released last summer, and I still didn’t get all the way through its contents. Case in point: The Chosen. 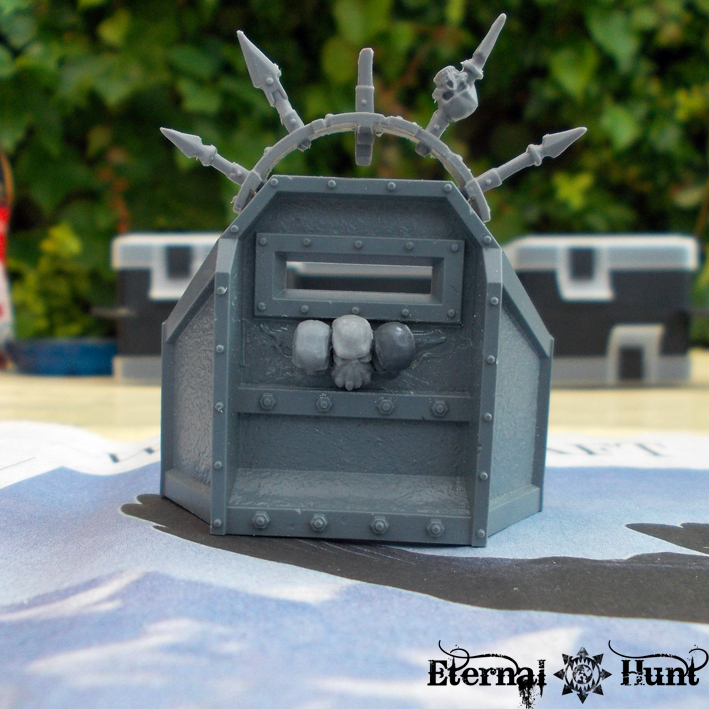 The box comes with six exquisitely detailed plastic Chosen. 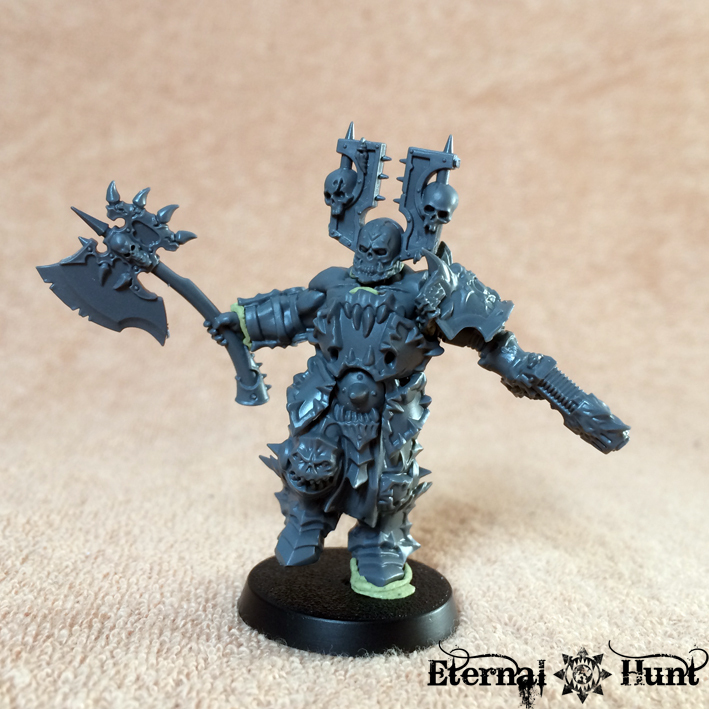 The models are so good that any chaos player should be happy enough to draft them into his forces, right? So why haven’t I done any work on these? 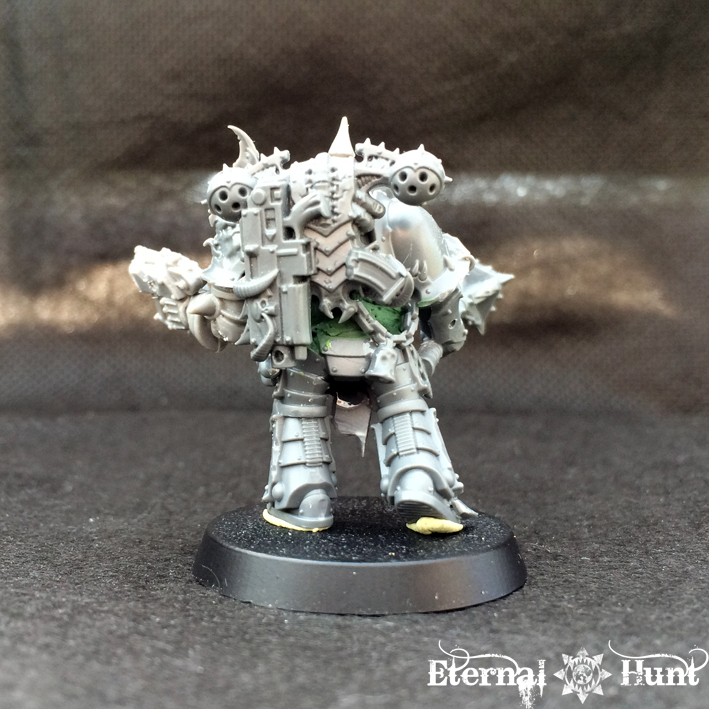 They are, without a doubt, some of the finest CSM models ever released, yet they have sat untouched in their box so far — what the heck is wrong with me? 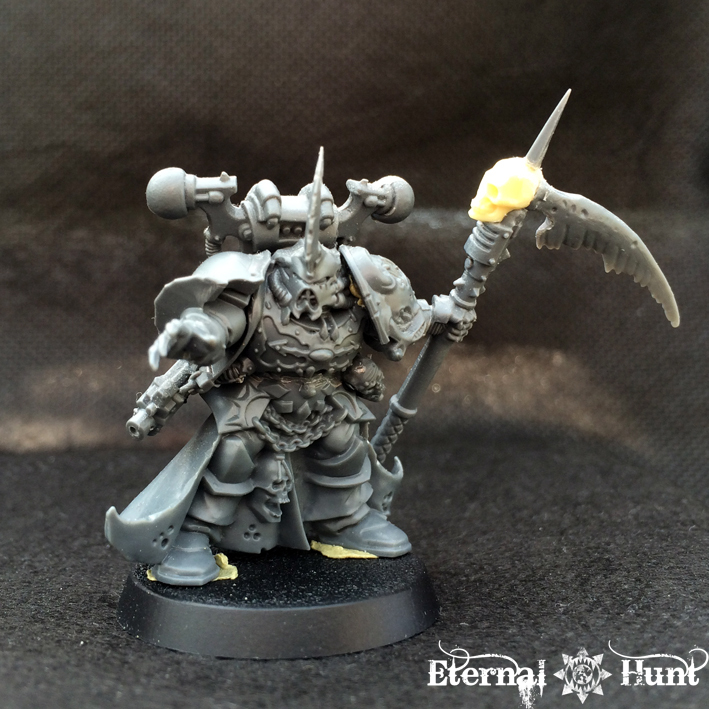 Well, there may be a couple of reasons, actually: First of all, I already converted some Chosen for my army before Dark Vengeance came along. 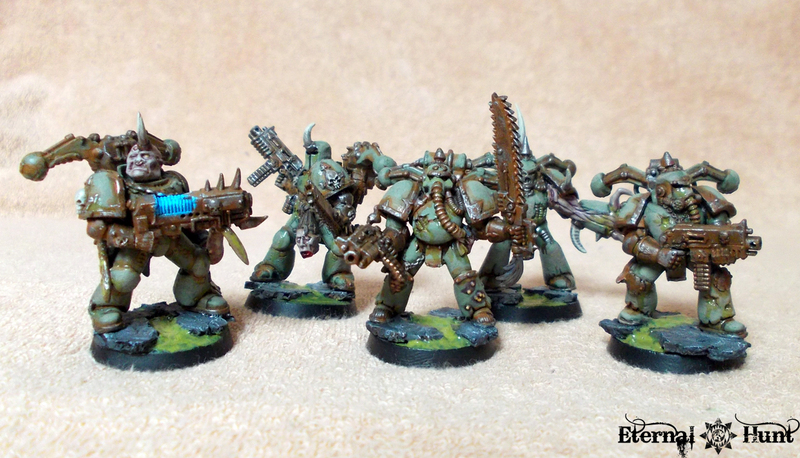 And while they may not look nearly as cool as these guys, they fit the look of my army. 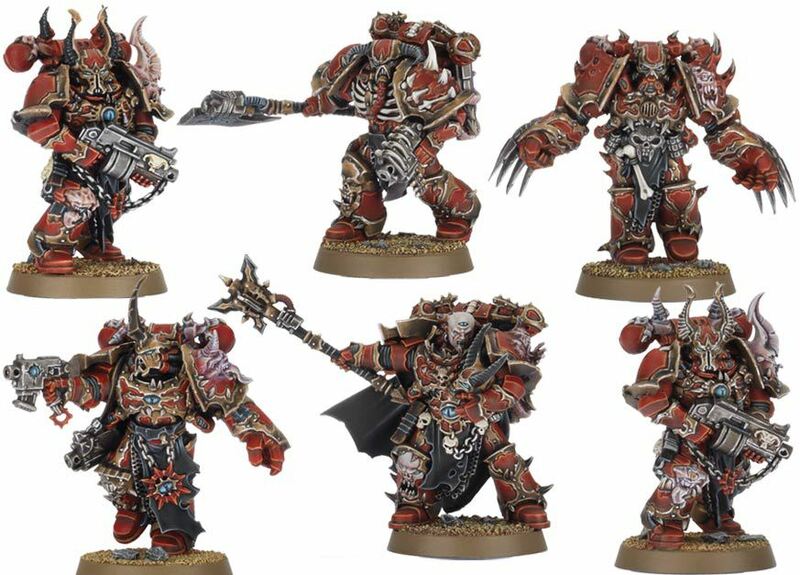 They also decidedly look like World Eaters, while the Dark Vengeance Chosen were designed to represent Chaos on a more global scale — and rightly so! 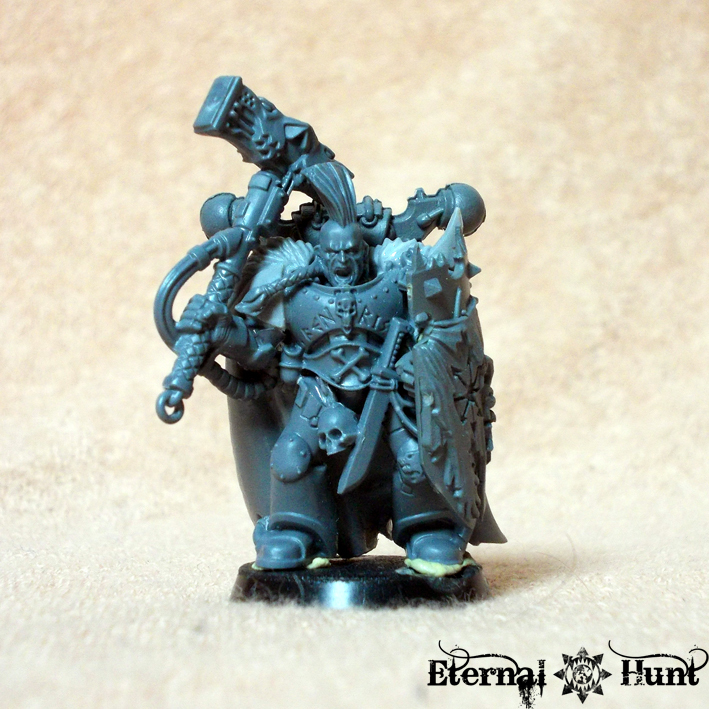 What this means, though, is that it is actually rather hard to find a place for these in my army. 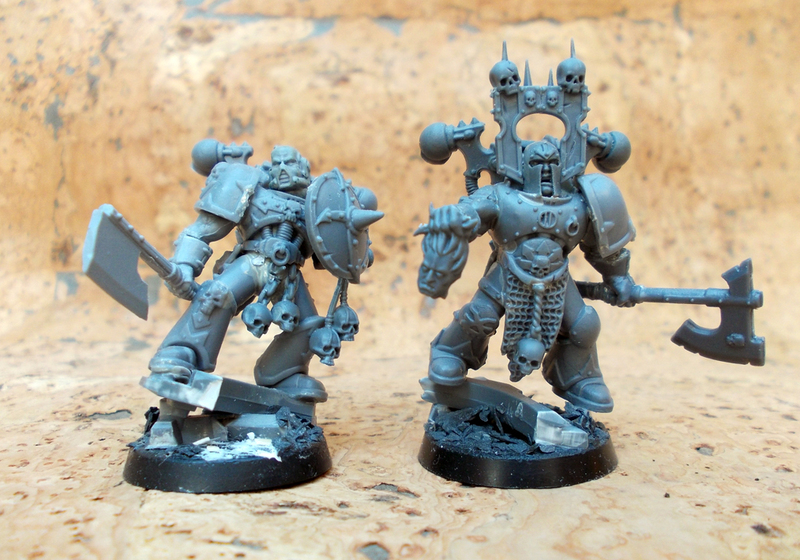 Plus I felt slightly reluctant to cut apart the beautiful models. 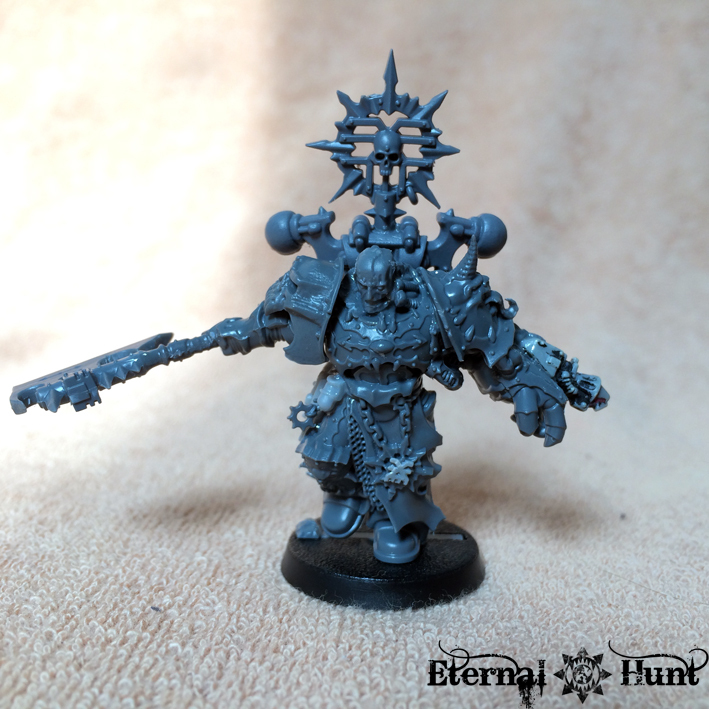 He may actually be my least favourite Chosen model: While he is nicely detailed, the model has a slightly squat look to it when seen firsthand. 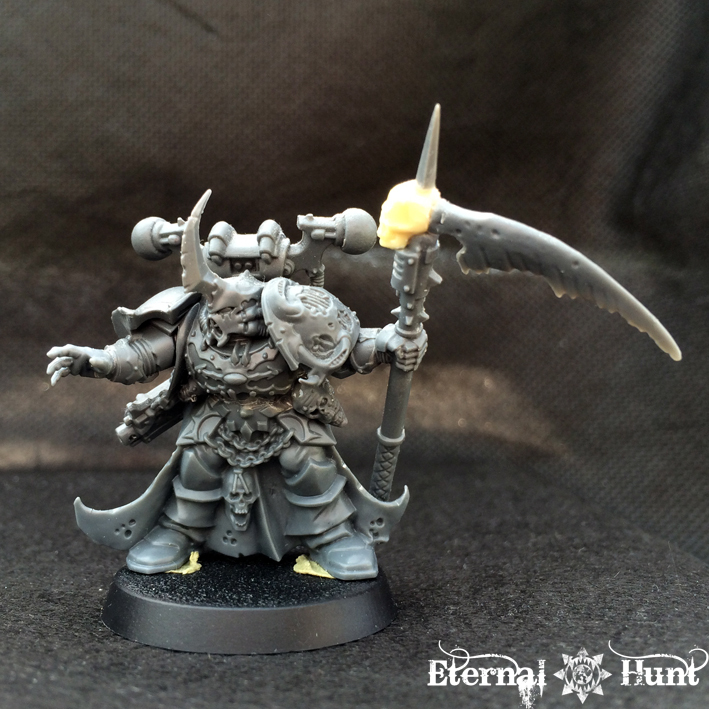 He did have a very nice power axe, though, so I used this guy as a donor when the time came to re-arm Lord Captain Lorimar. 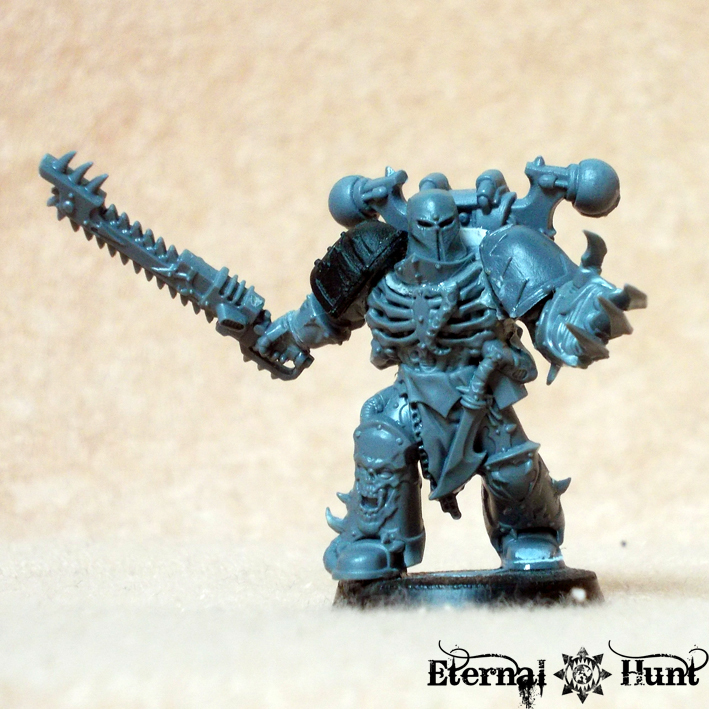 After that, things didn’t look to good for the poor Chosen: Without a CC weapon left, it didn’t really look like this guy was being fast-tracked for promotion in the World Eaters’ 4th assault company. 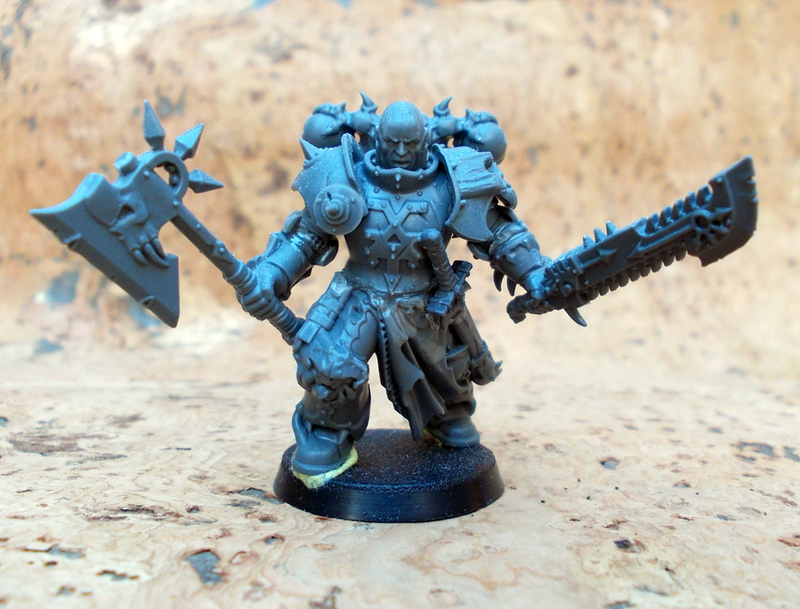 But for some reason, I picked up the model recently and started to work on it: After all, the new challenge rules in Codex Chaos Space Marines meant I was in dire need of a skull champion or two wielding power weapons. And there was no reason why I shouldn’t use this guy for that, right? 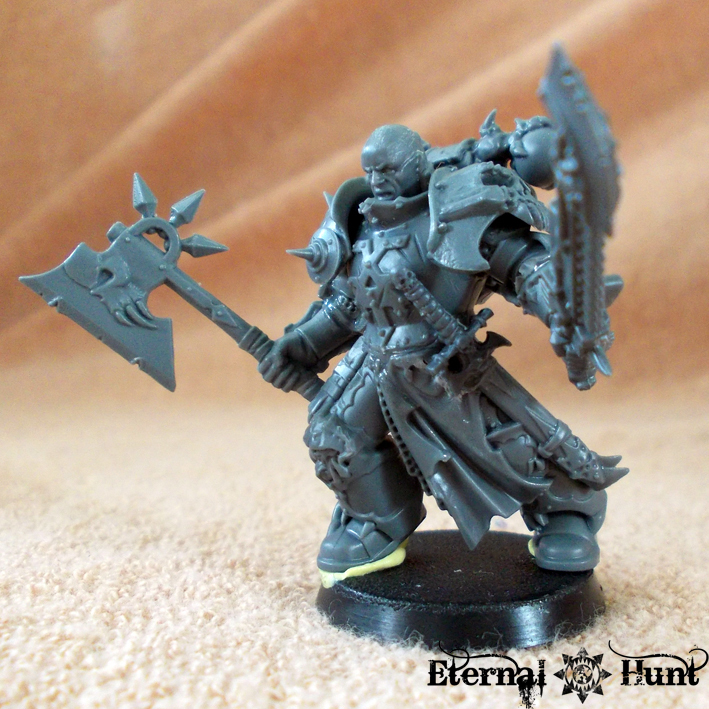 Anyway, while this was a fairly simply conversion, I still think the model now makes for a rather imposing skull champion! 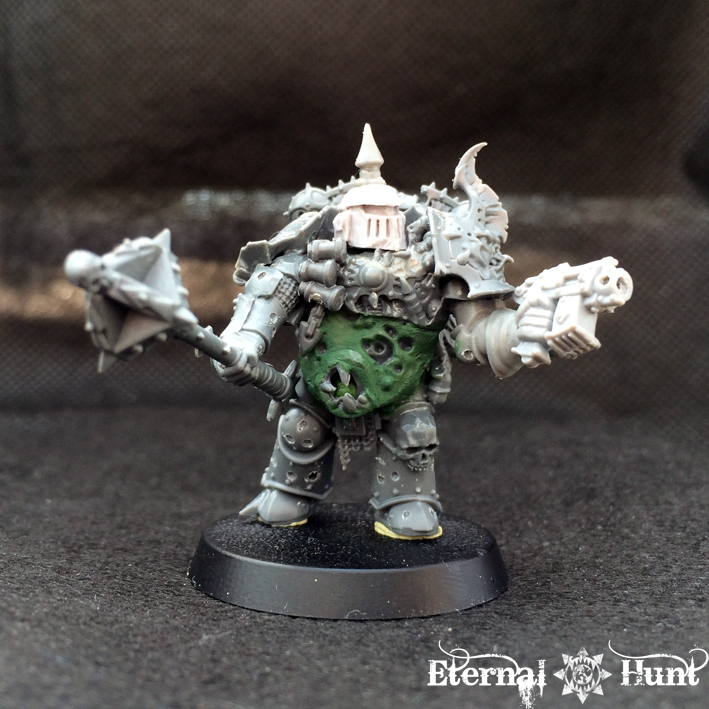 Again, a nice model, but he really doesn’t look like a World Eater. 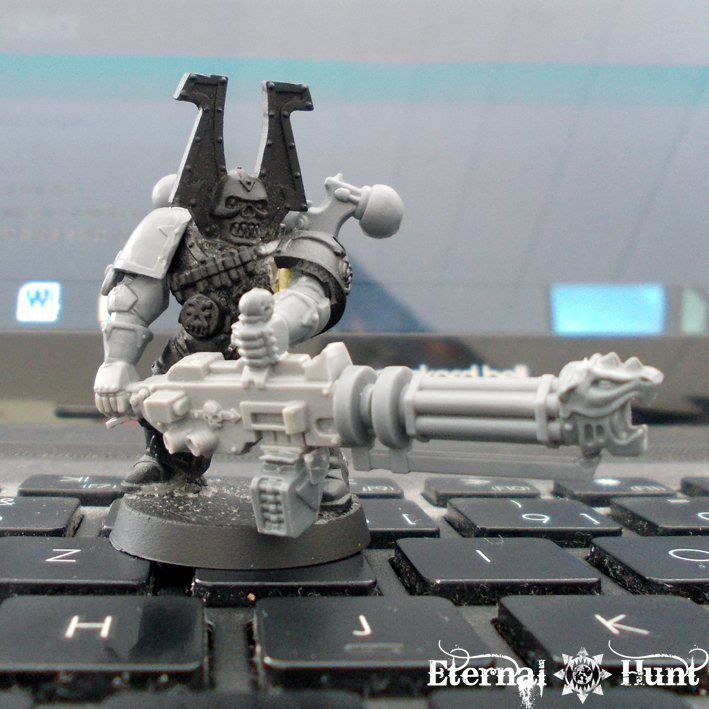 The fact that he’s armed with a Bolter doesn’t really help either. 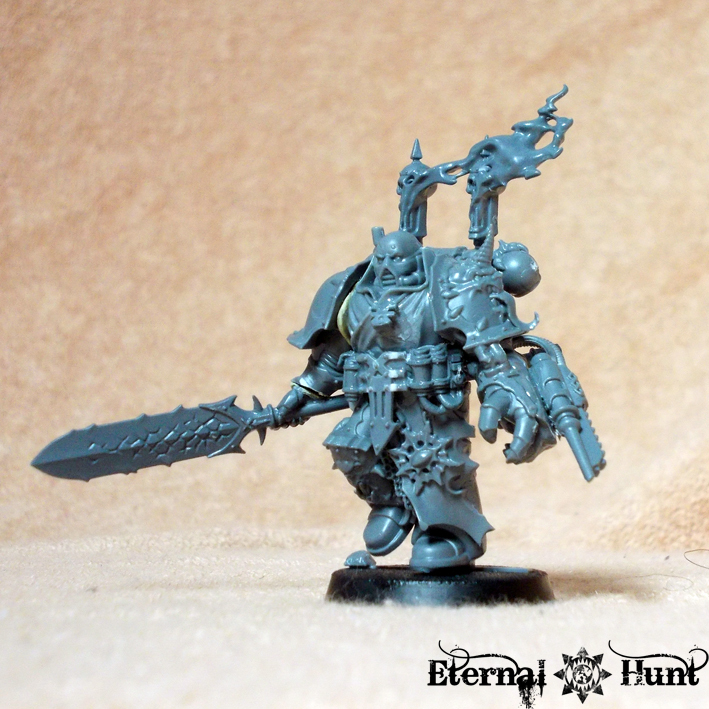 And due to the fact that there are actually two models of this particular design in the box, I could actually try a more involved conversion without destroying a unique model. 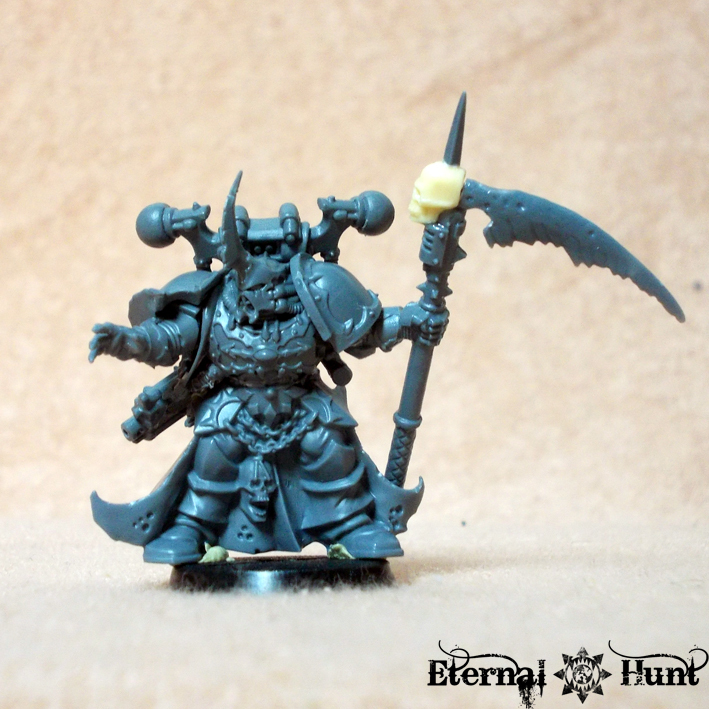 What I especially like about this conversion is that it really developed quite organically without much of an overarching plan in place. 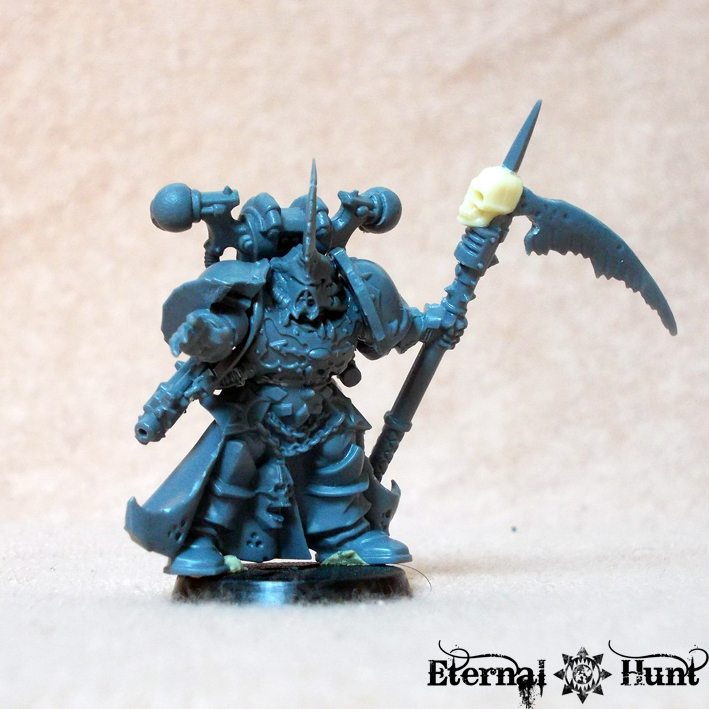 It also looks quite different from the original model (and, again, much more like a servant of Khorne) now. So it looks like I have found a place for the first two Chosen at last. I don’t doubt that their buddies will also find their calling in due time. 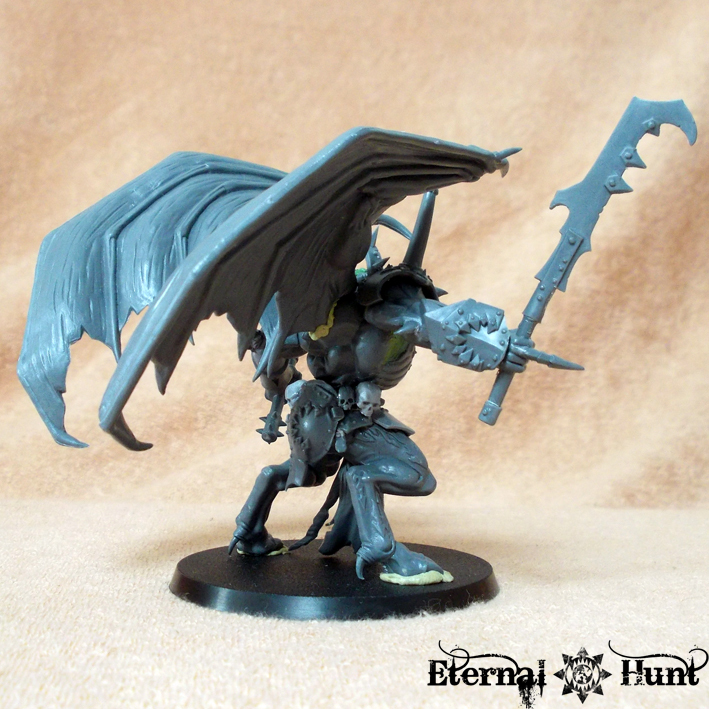 In any case, I love the fact that the Dark Vengeance starter box is still fun to work with, even months after its release. 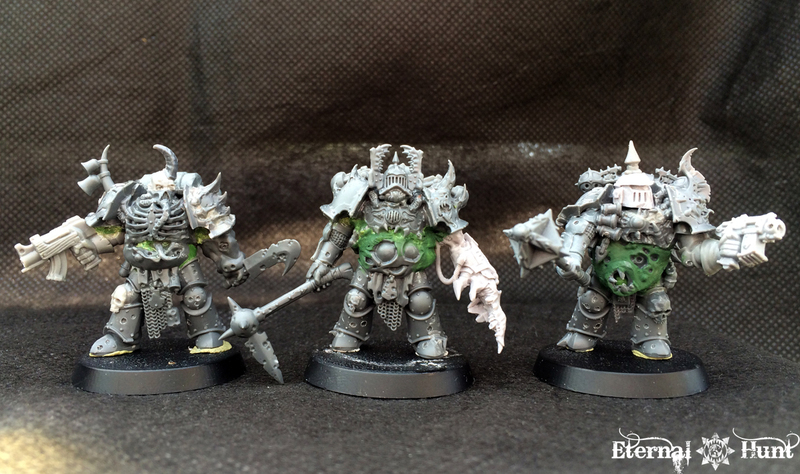 Any thoughts on these conversions? Just drop me a comment! And, as always, thanks for looking and stay tuned for more!